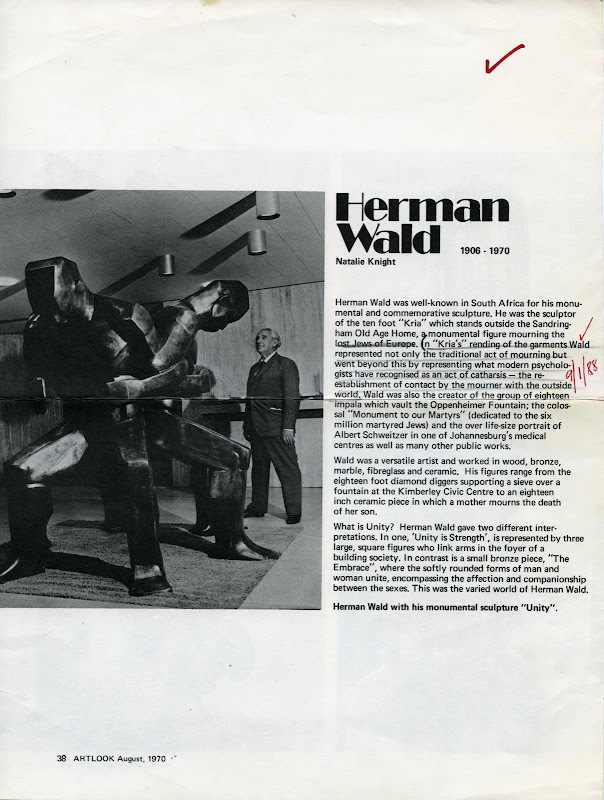 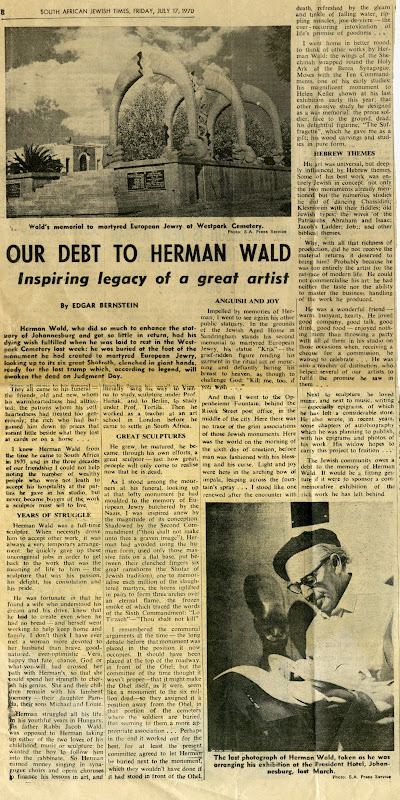 1)From HW letter to the 'Studio' magazine in London. 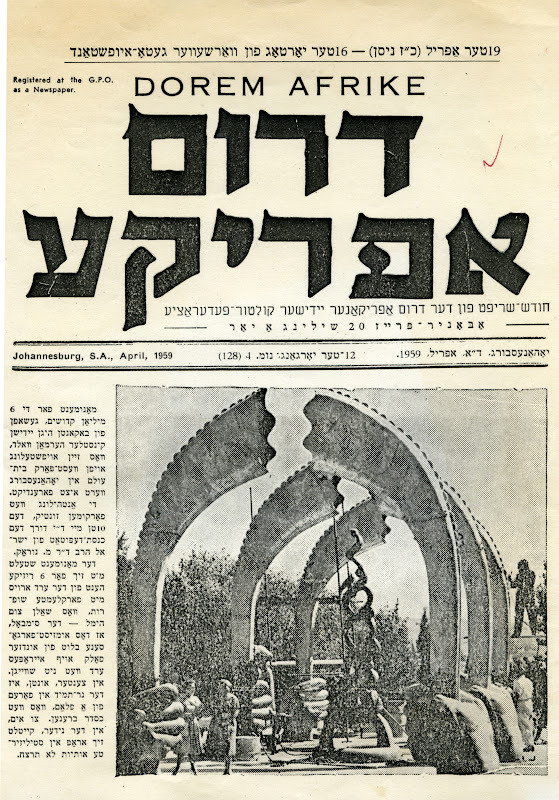 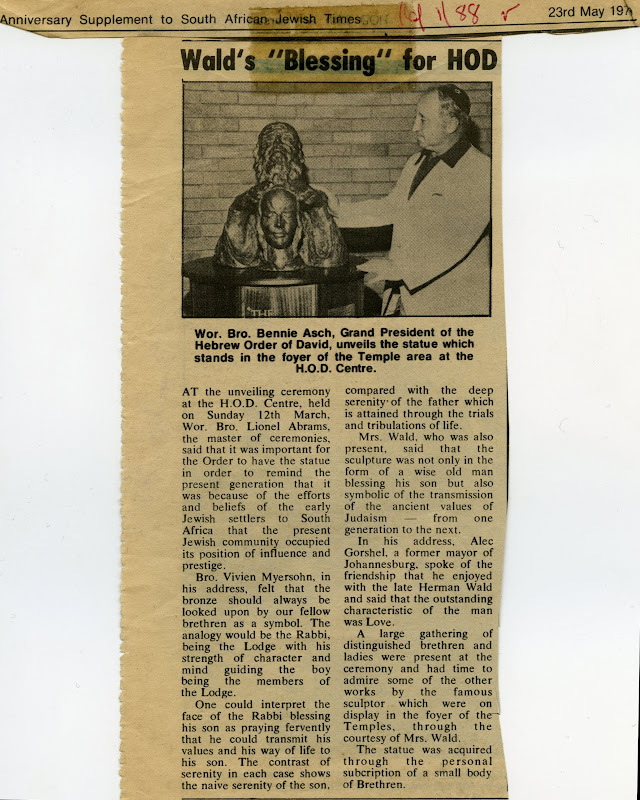 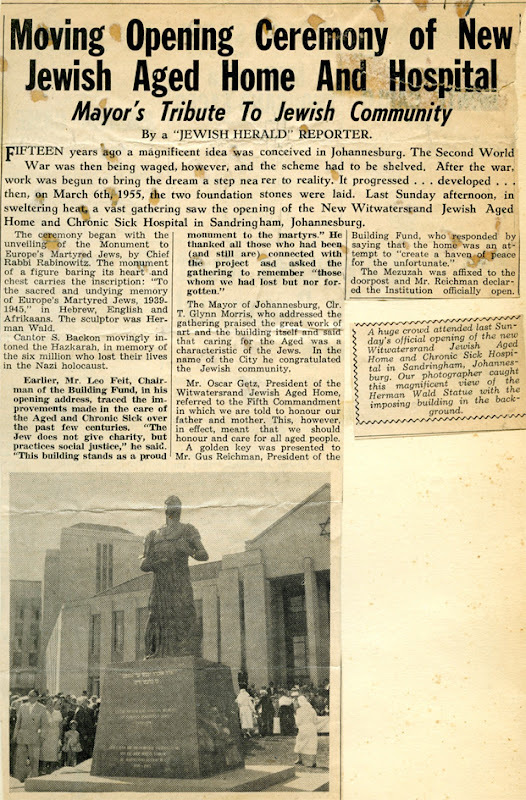 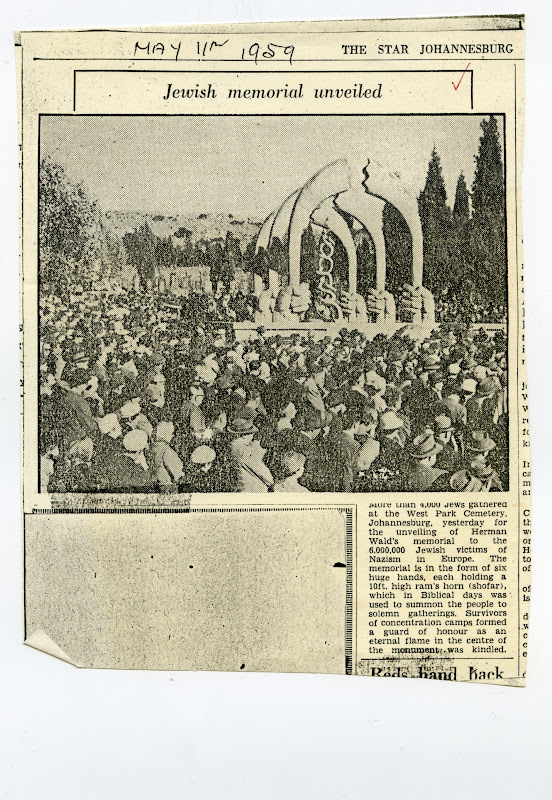 "The other photograph is a picture of a monument unveiled on the the 10th of May 1959 by Rabbi M. Neurock, member of the Israeli parliament who specially travelled to S.A for that purpose. 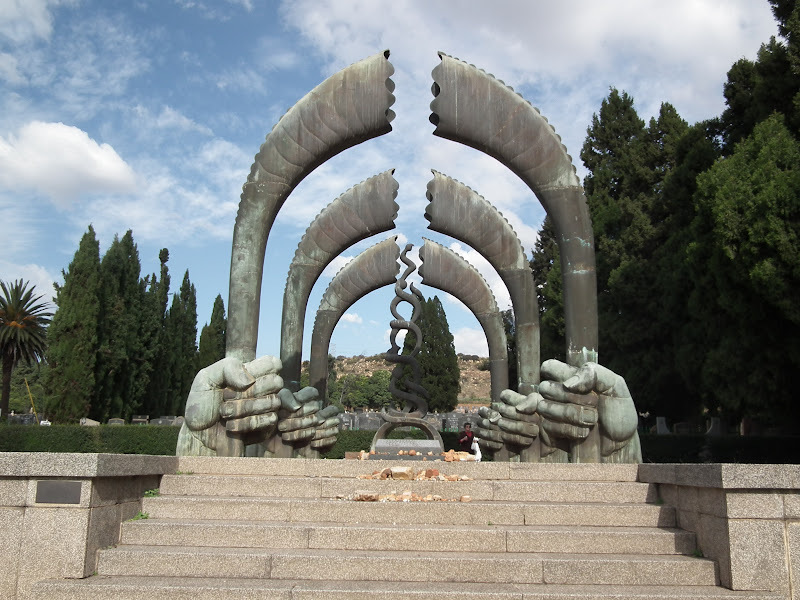 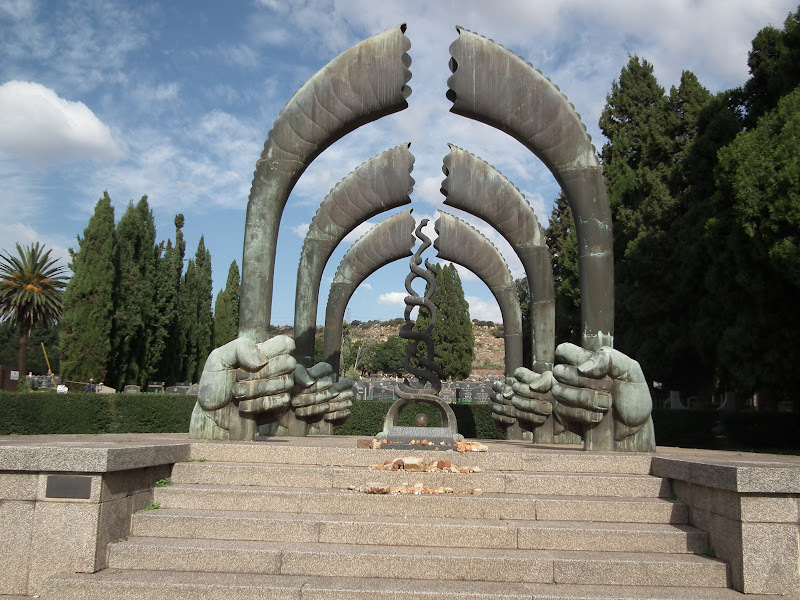 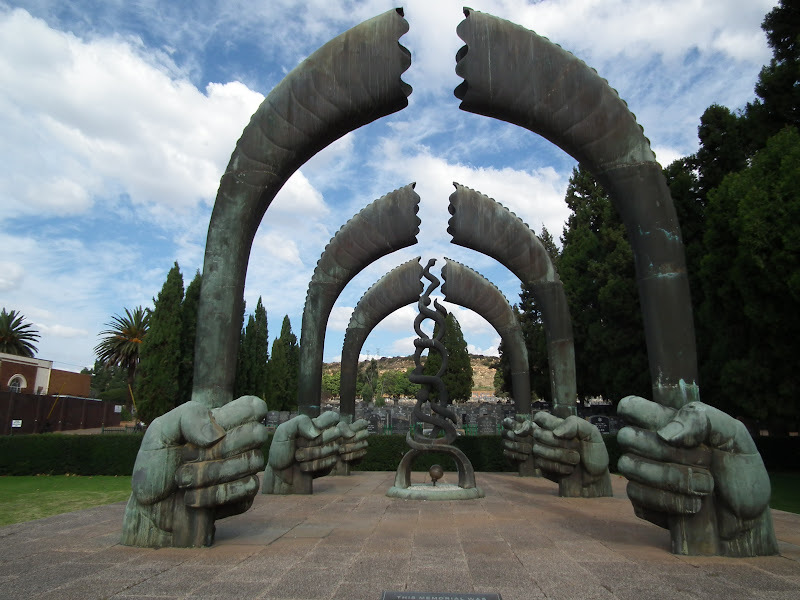 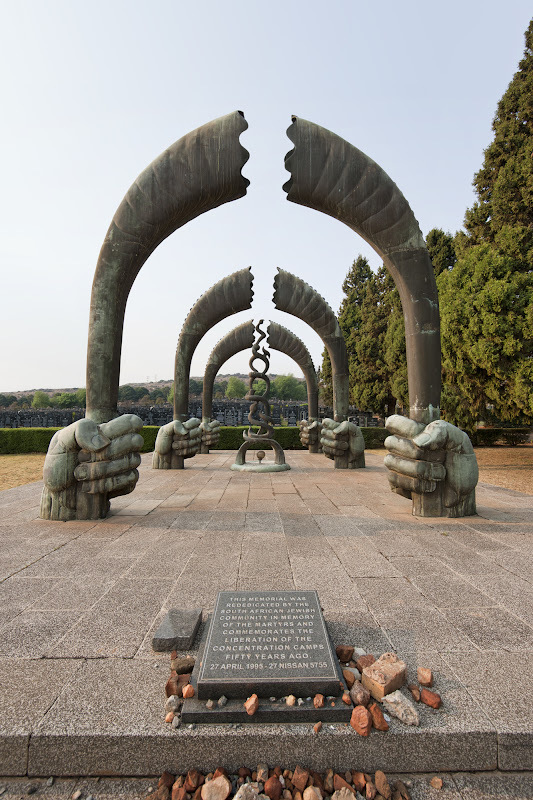 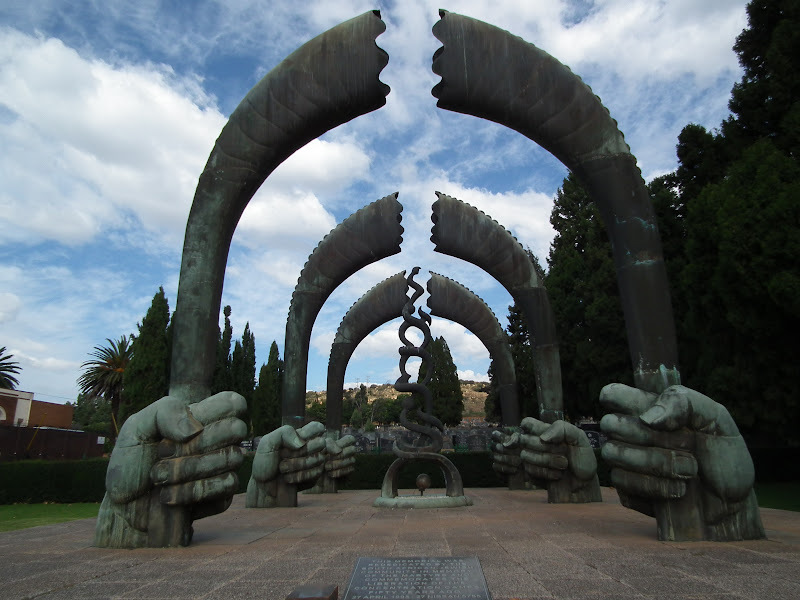 This monument depicts six mighty bronze fists, each five feet high ,bursting out of the ground as a protest of the dead,each fist representing one million Jews who perished under Hitler, and each gripping a ram's horn, the Jewish ritual trumpet standing twenty feet high.In pairs they create three arches ;the arches of trials and tribulations that the Jewish people have all gone through during all the generations of persecution. 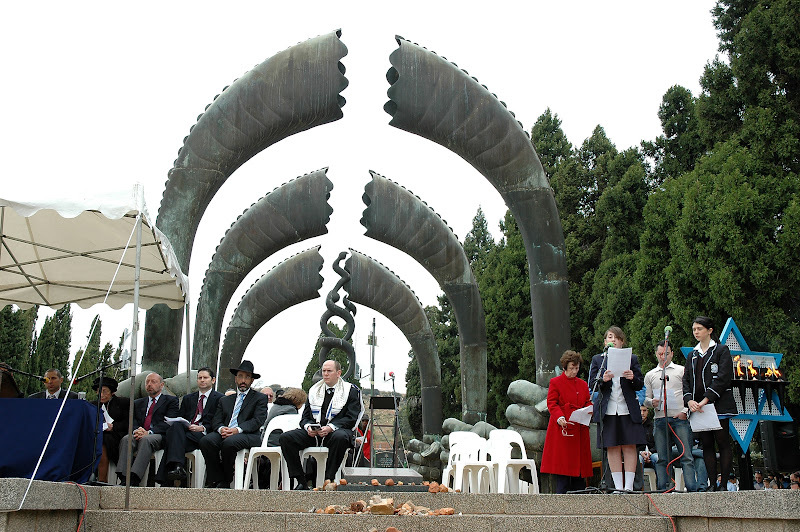 in the centre there is a flame shaped Eternal Light,spirallingg fifteen feet up.Through the ram's horns the Dead are blasting out the Sixth Commandment: "Though shalt not kill", while the centre eternal light is stylised through the medium of the Hebrew lettering,to form a flame which spells in Hebrew "Lor Tirtzach" (thou Shalt Not Kill)." 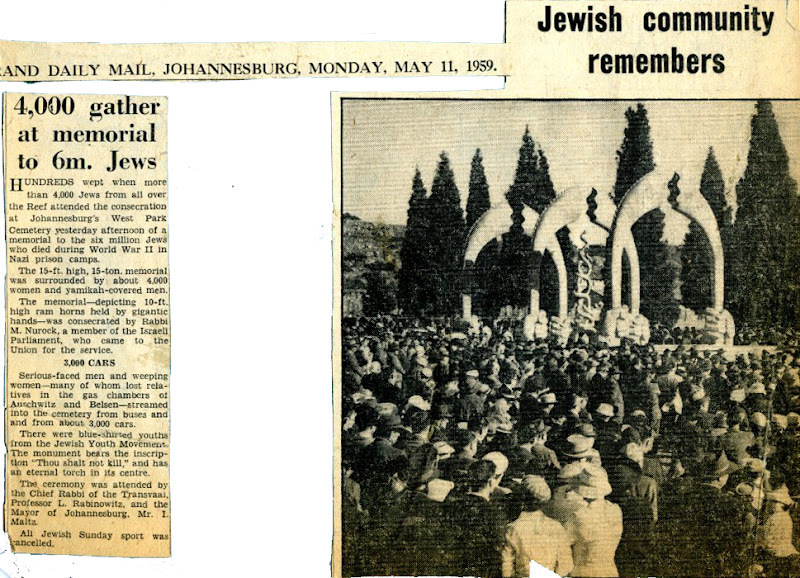 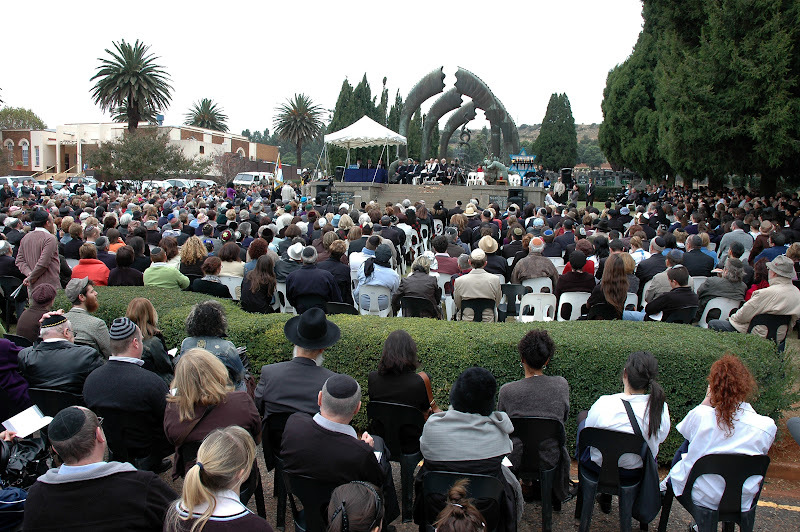 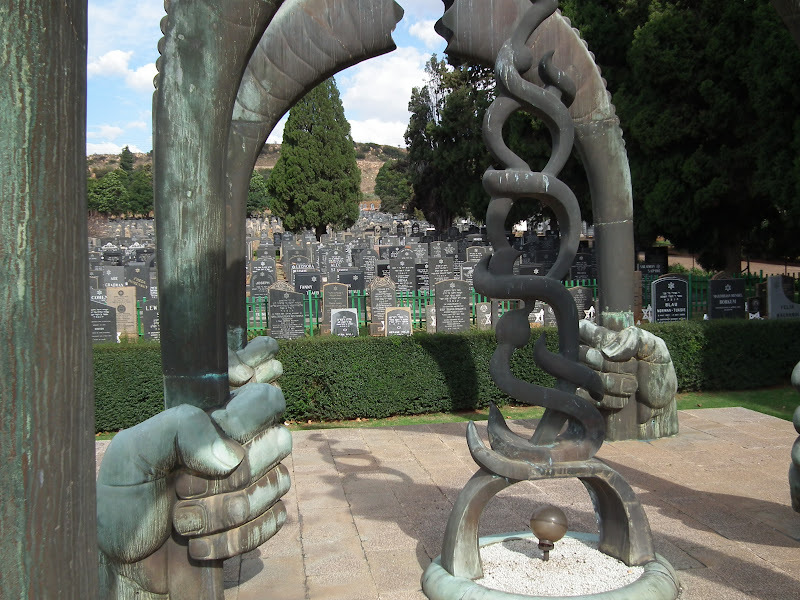 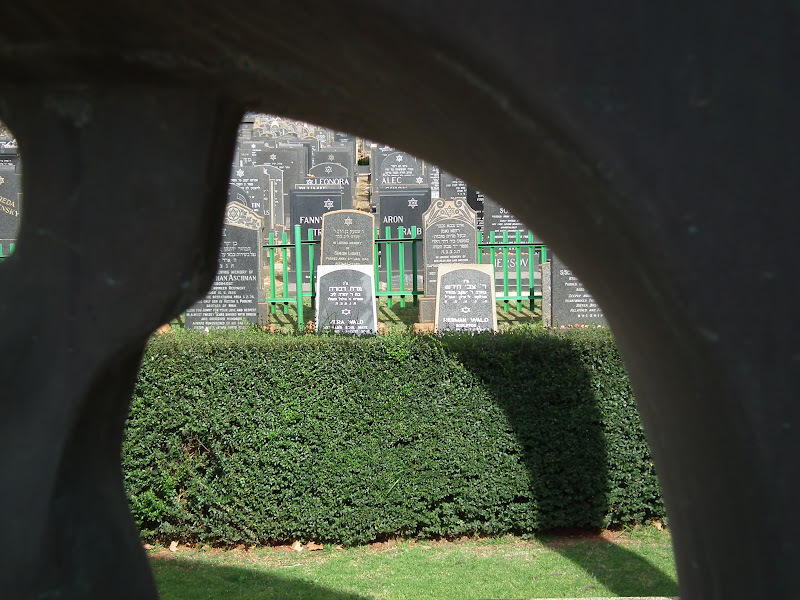 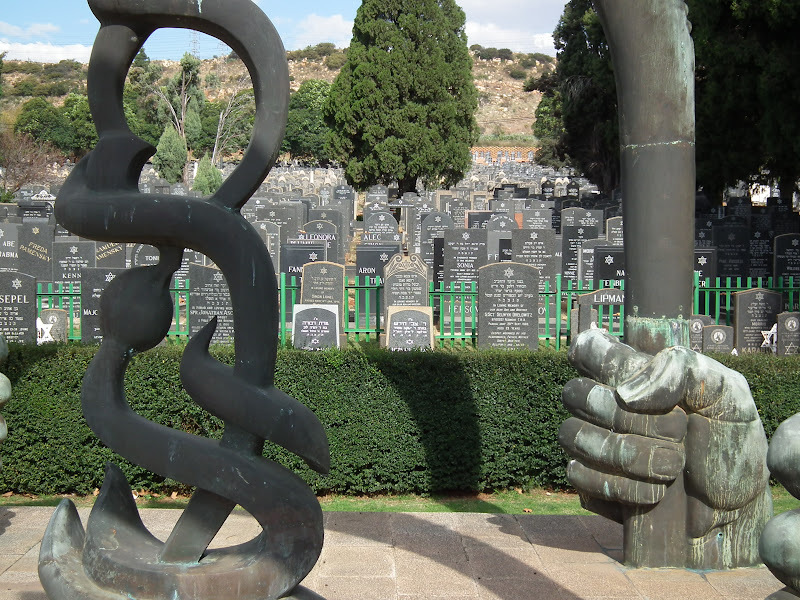 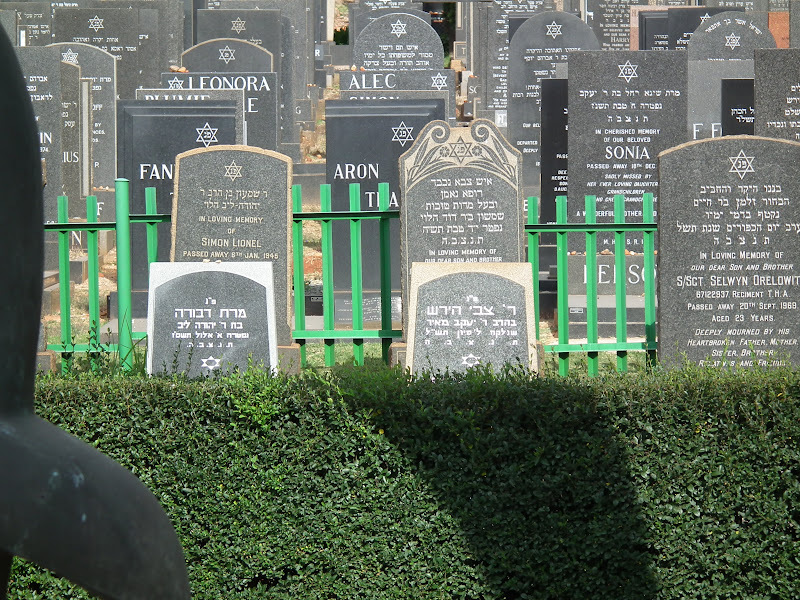 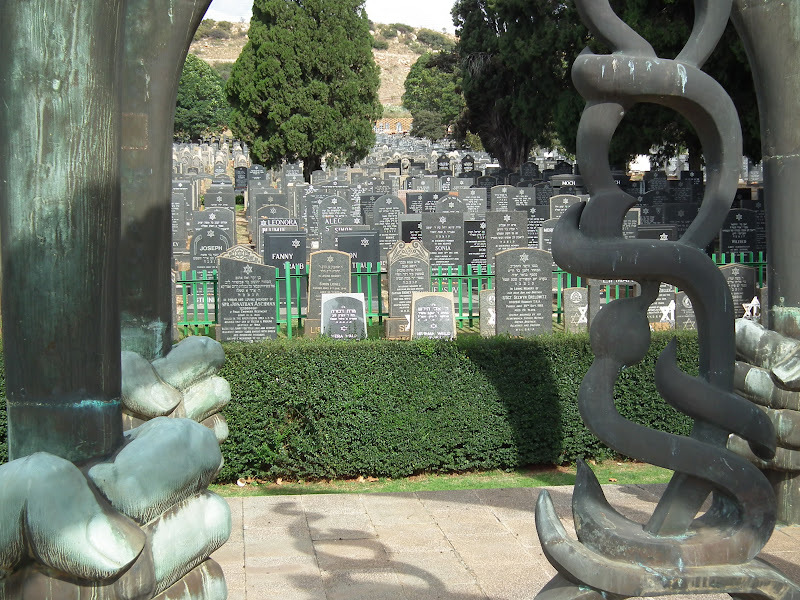 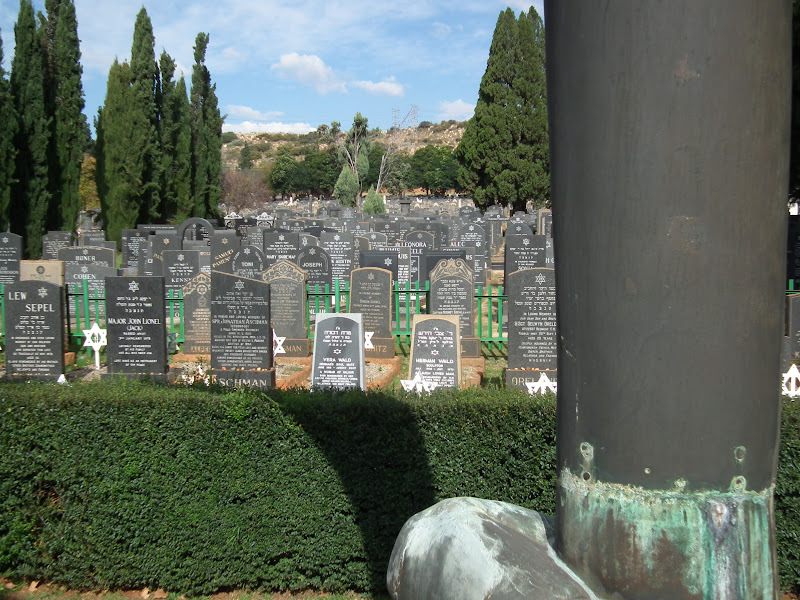 2)The monument is located at the Westpark Jewish Cemetery in Johannesburg.Each year the Rememberance to the Six Million ceremony is held at the monument with the base as the platform for the speakers and choir. 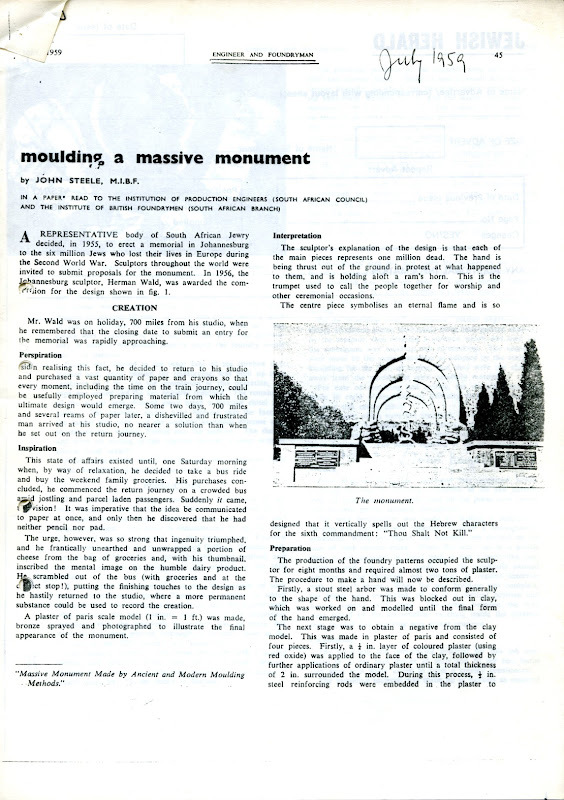 3) There was an inquiry in about 1977 from Cleveland ,Ohio about erecting a copy of the monument there. 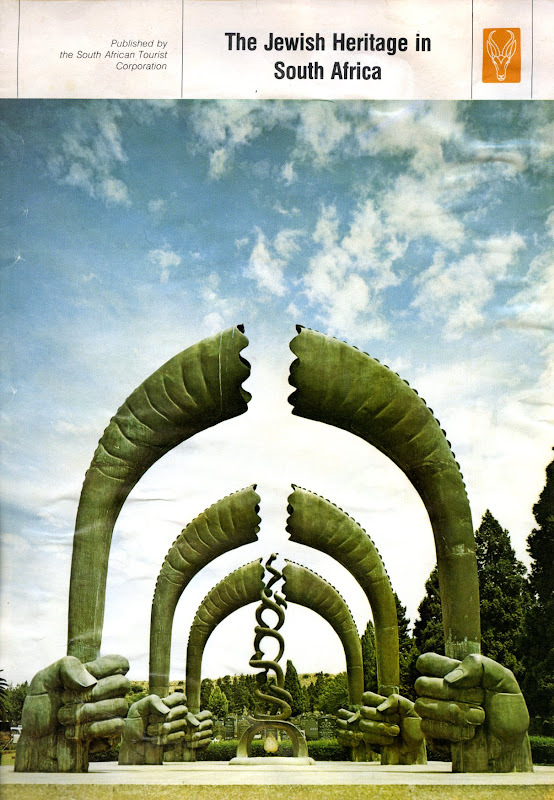 Nothing came of it. 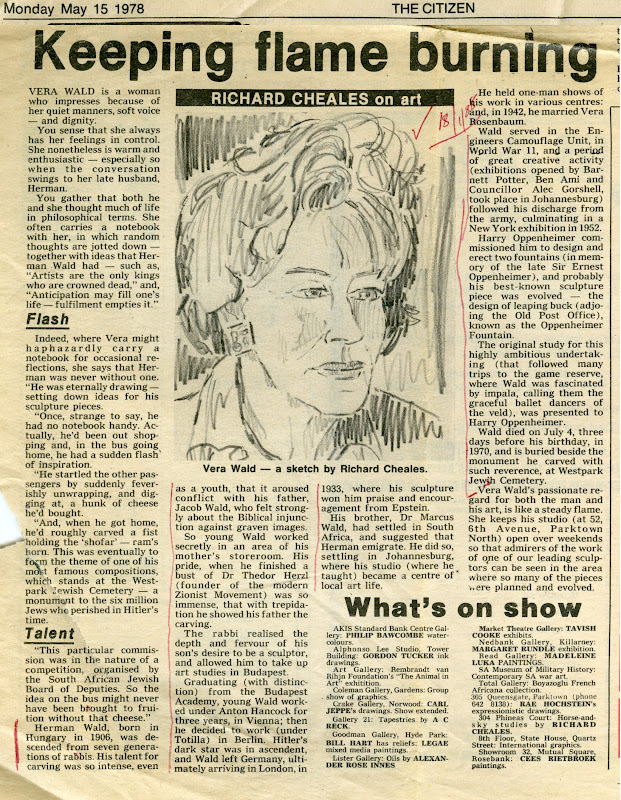 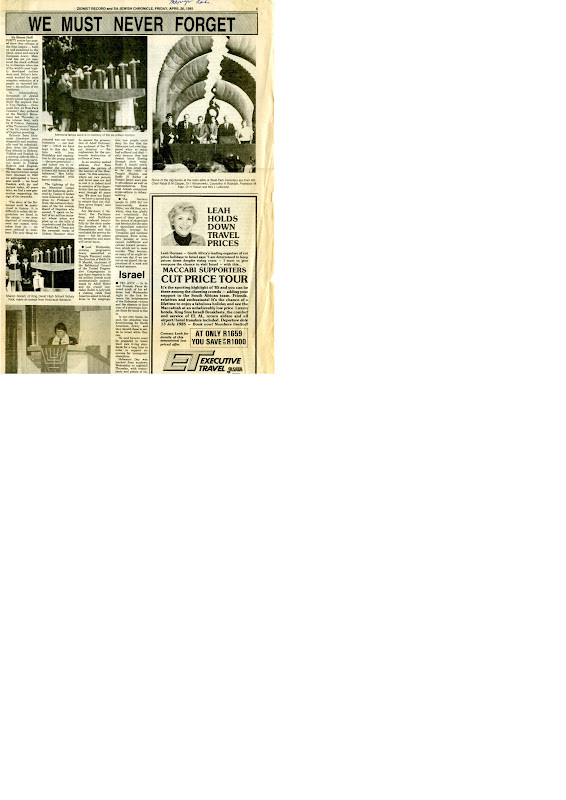 4) NA The Star 21/4/59 Front page with photo. 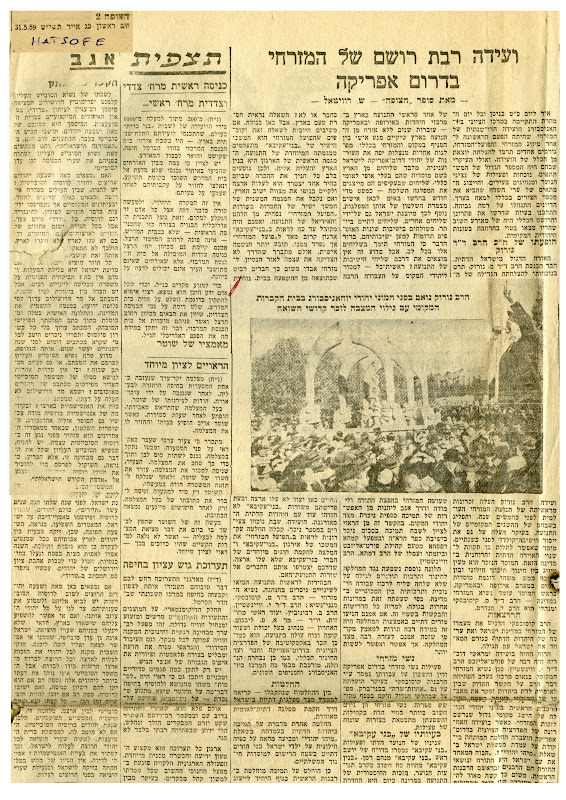 - The Star 11/5/59 Picture of unveiling which took place 10/5/59 - Dorem Afica April 1959 photo and description in Yiddish. 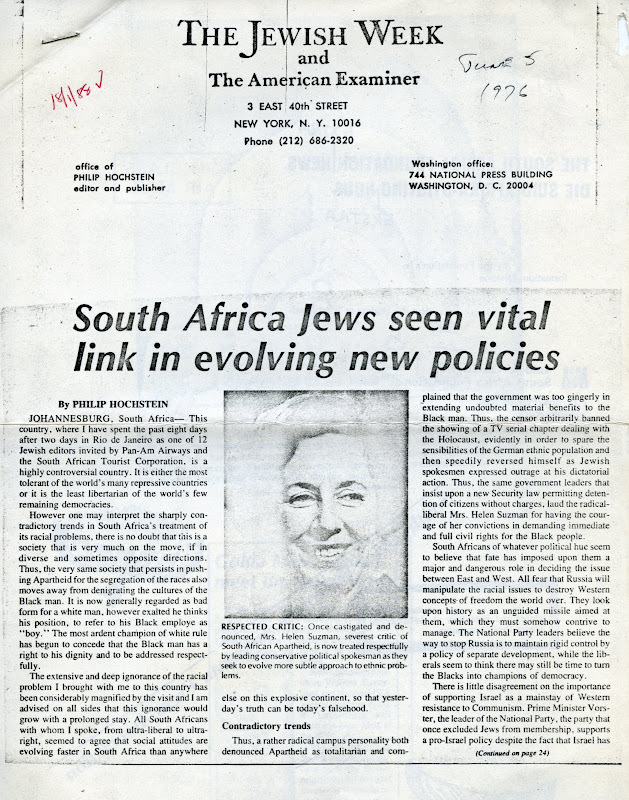 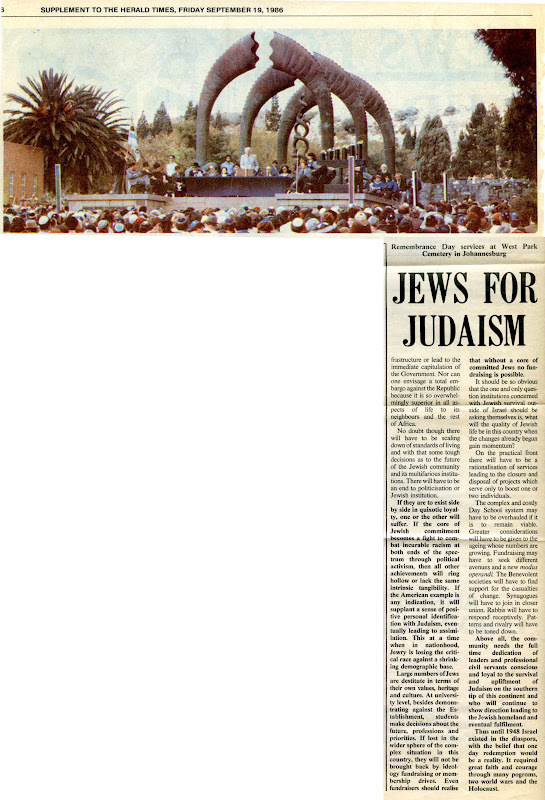 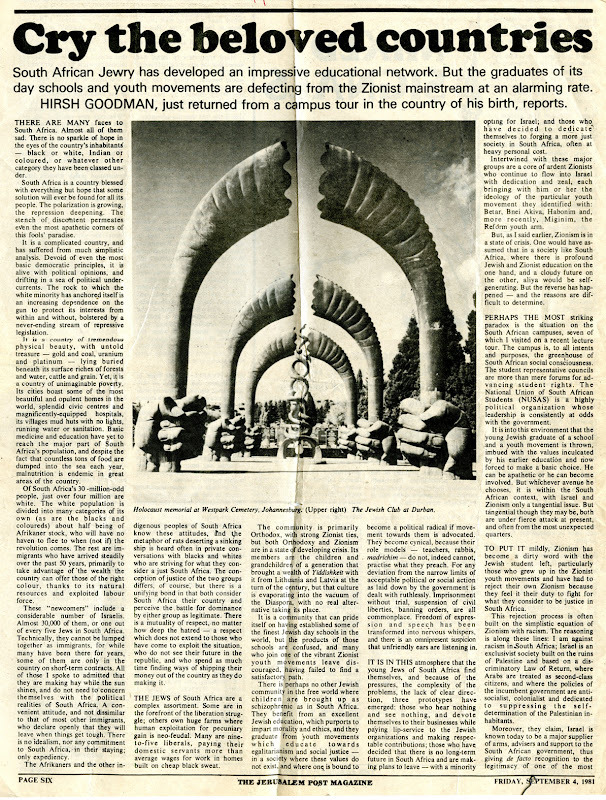 - Jewish Herald Rosh Hashanah Annual 2/10/59 front cover. 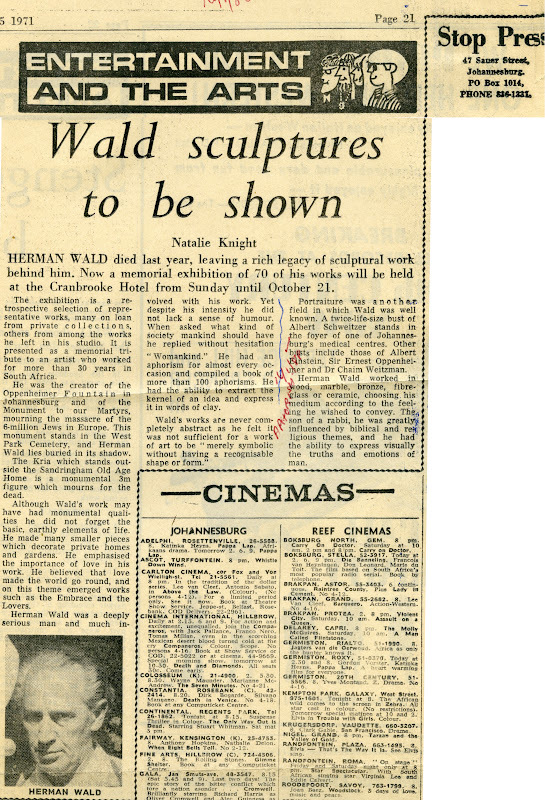 - Rand Daily Mail 19/7/1956 'Reminder'. 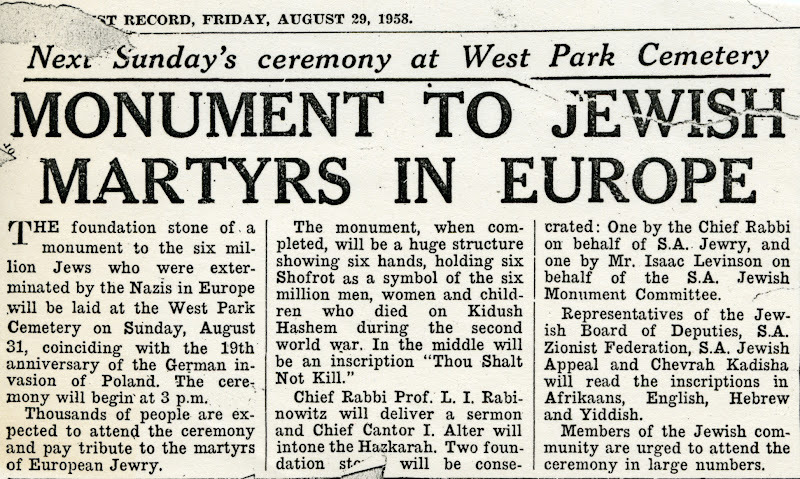 - Zionist Record 29/8/58 'Monument to Jewish martyrs in Europe. 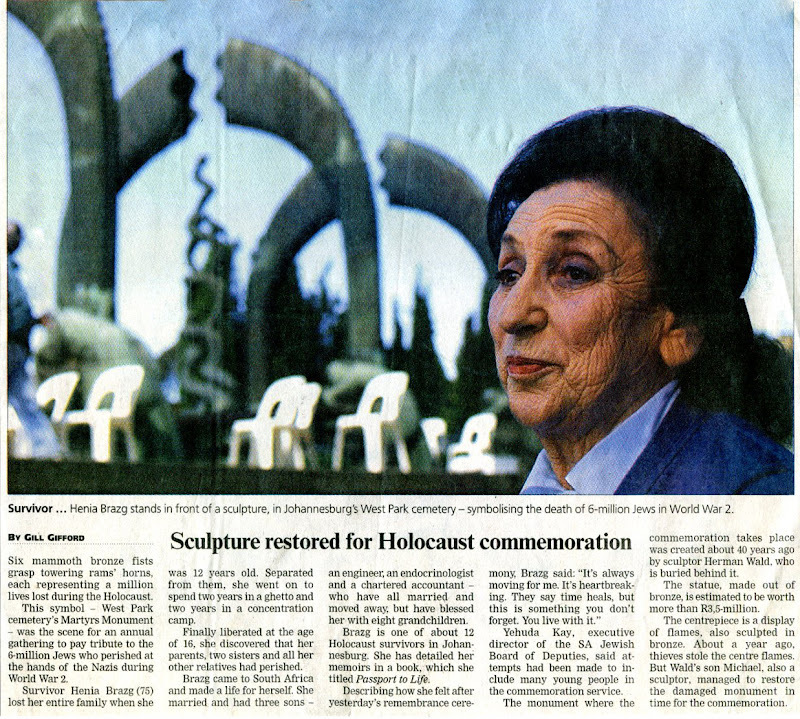 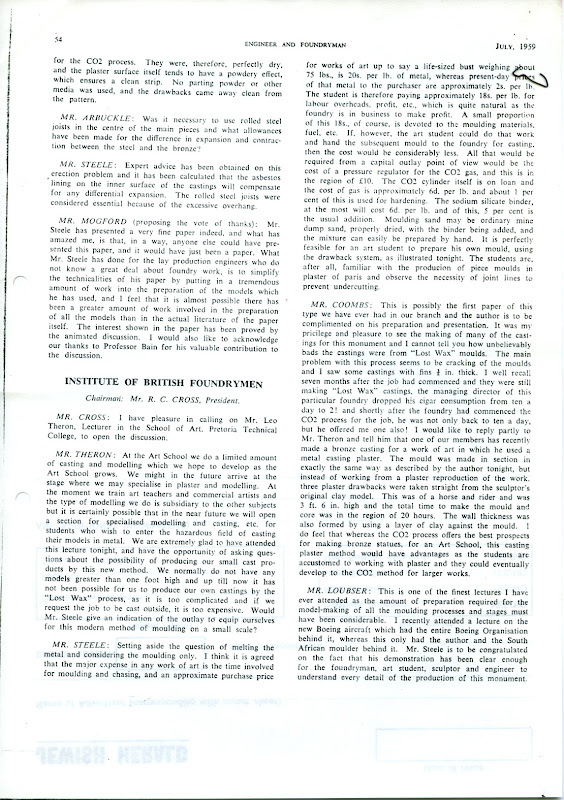 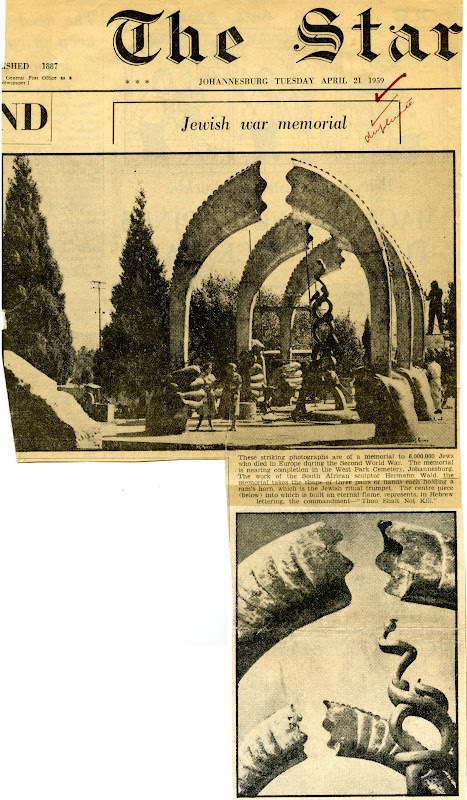 - Jewish Herald 26/9/58 Apology to HW about incorrect report that Whitkin (student of HW) helped to design monument. 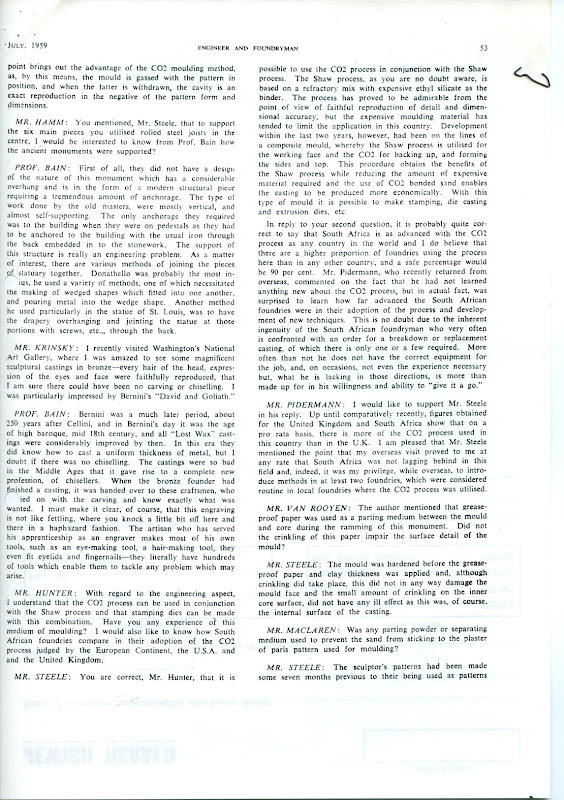 - New York Times 11/5/59 page 12. 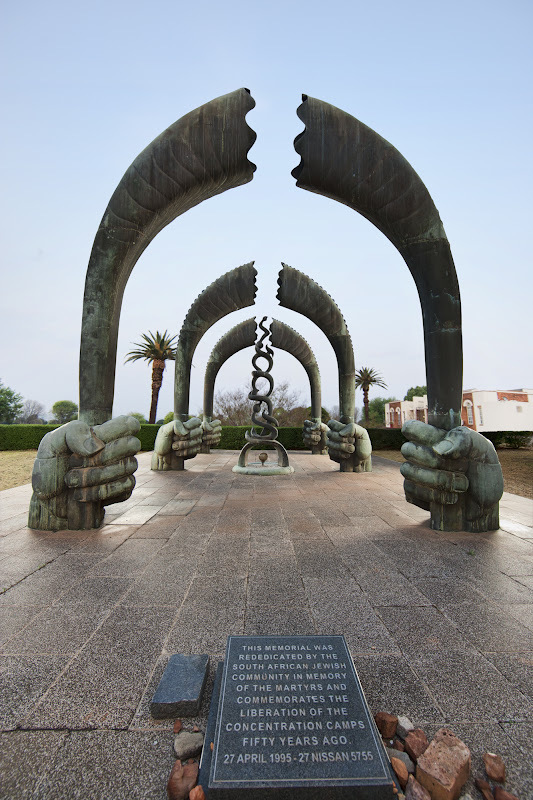 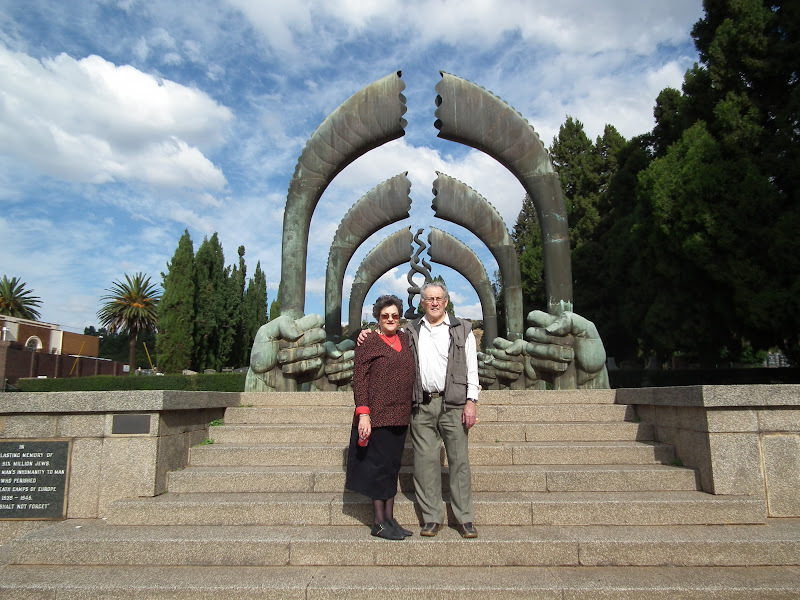 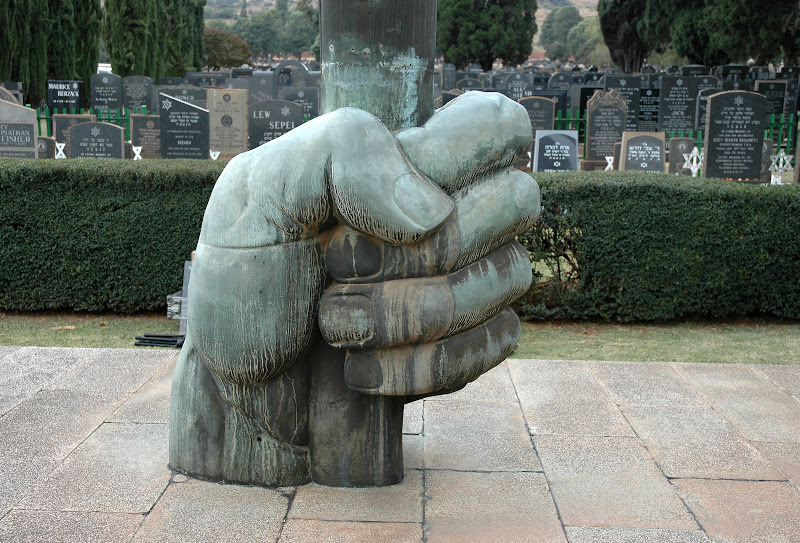 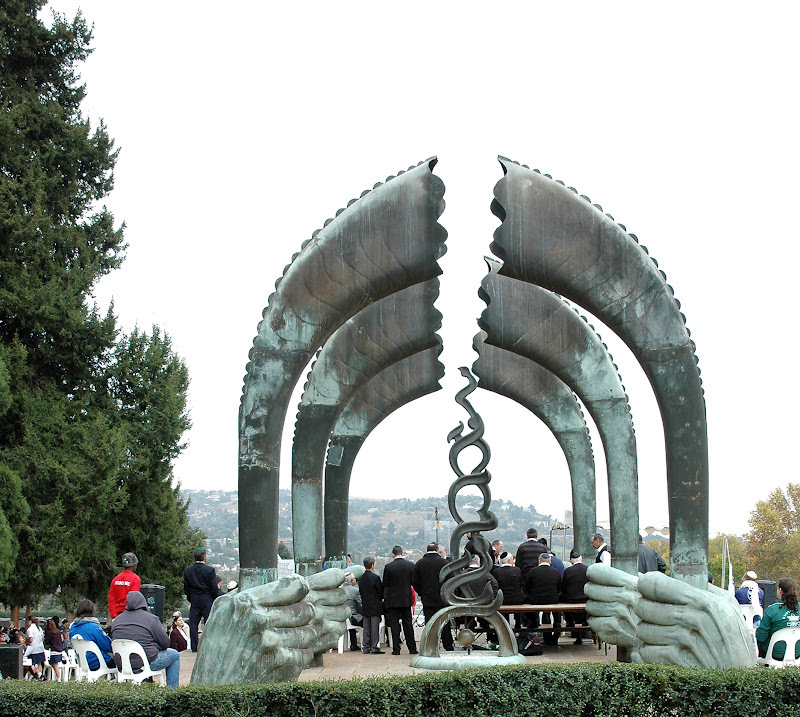 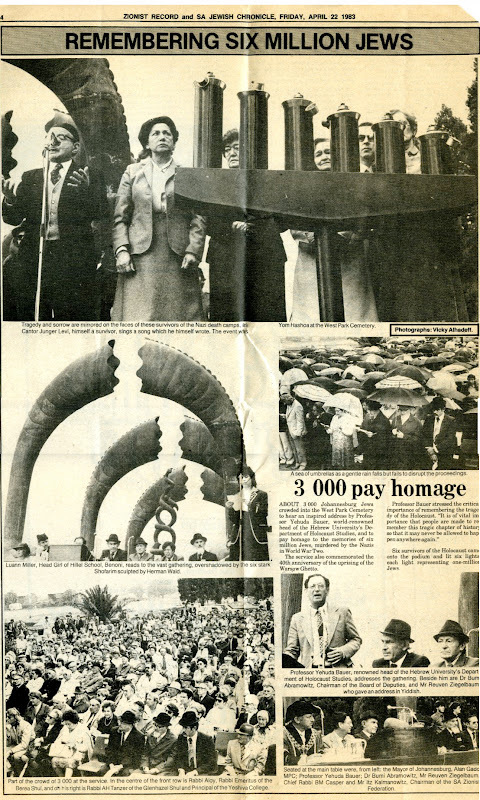 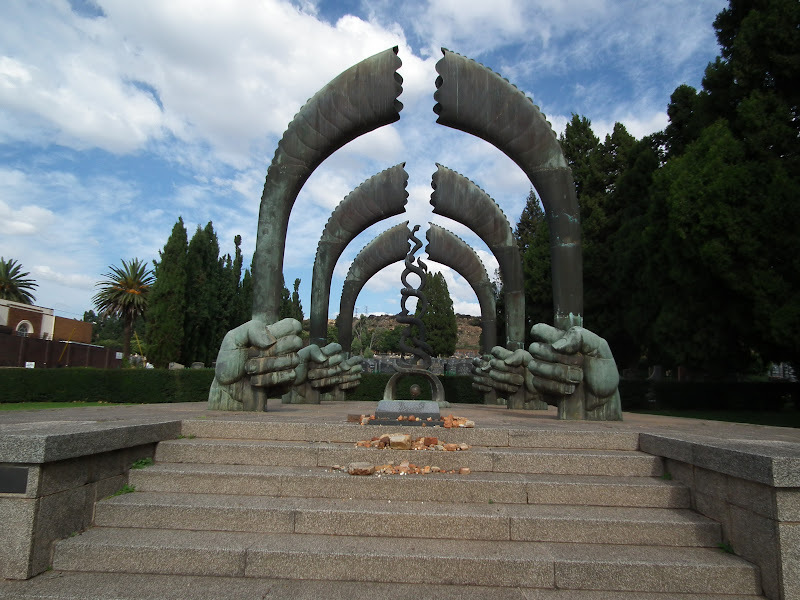 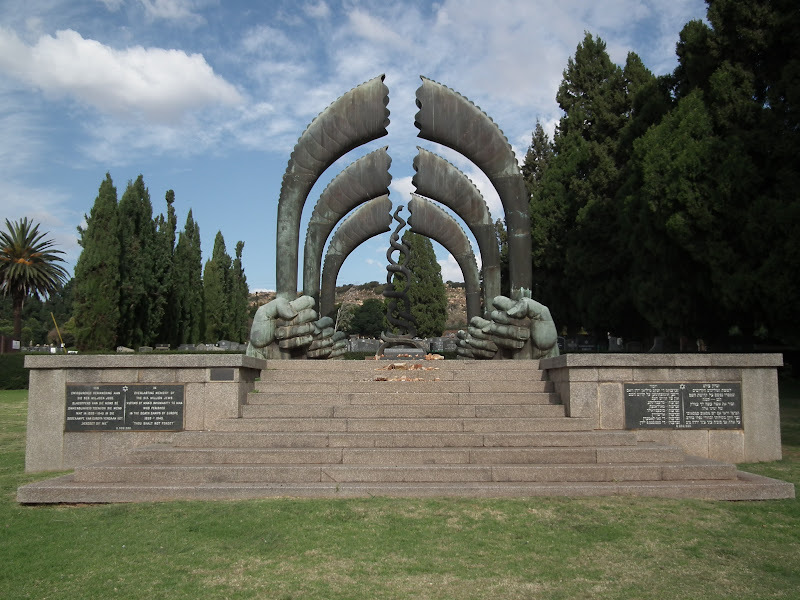 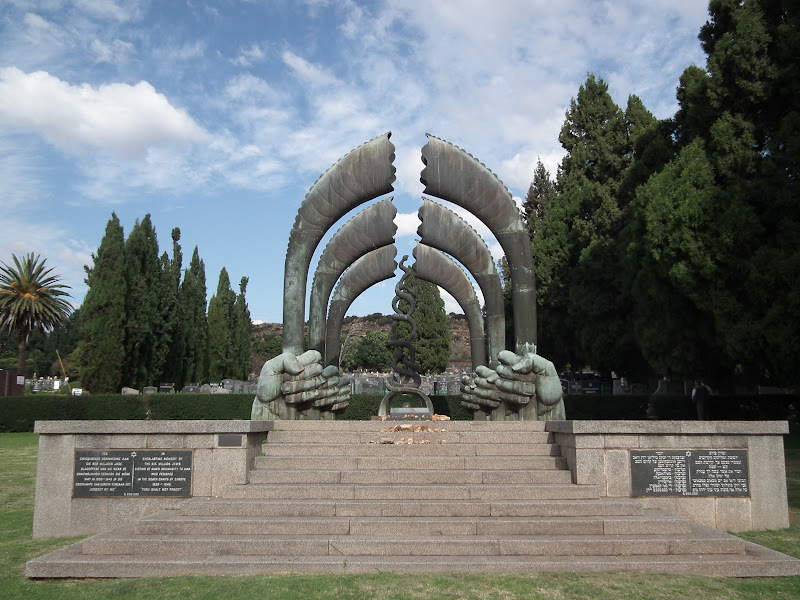 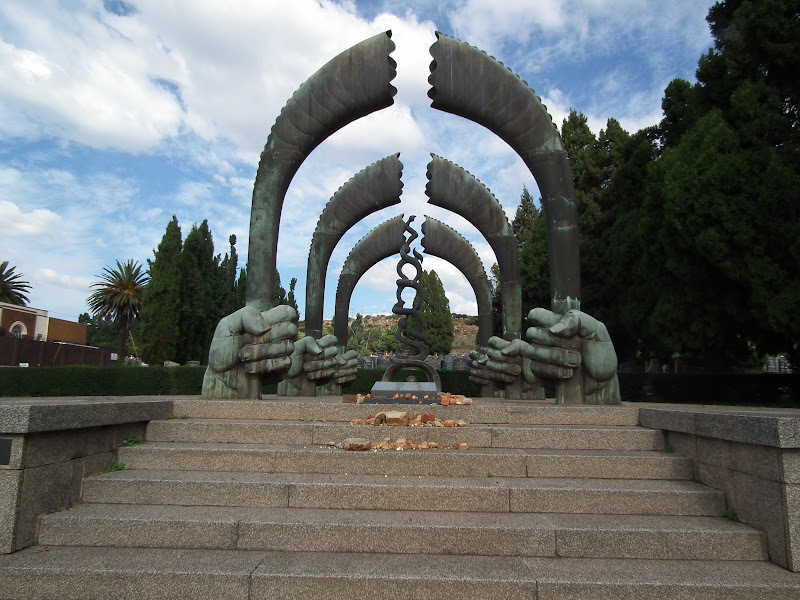 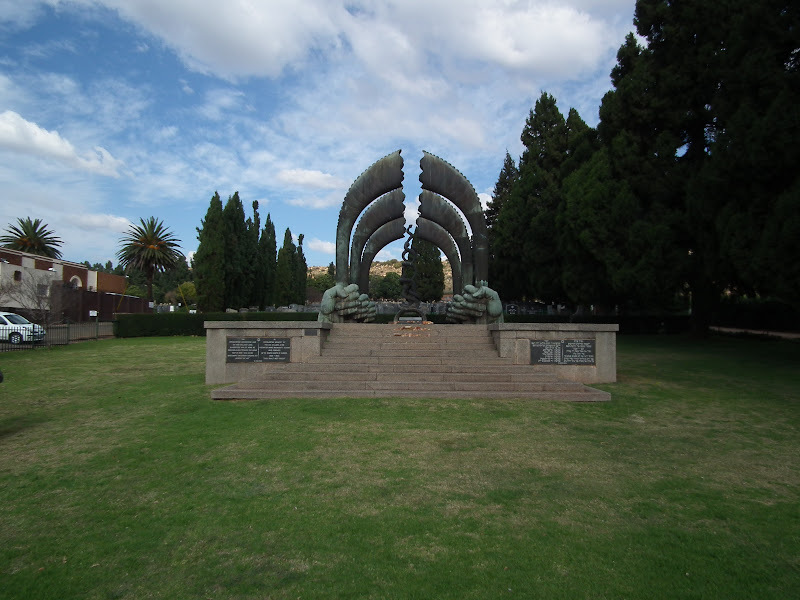 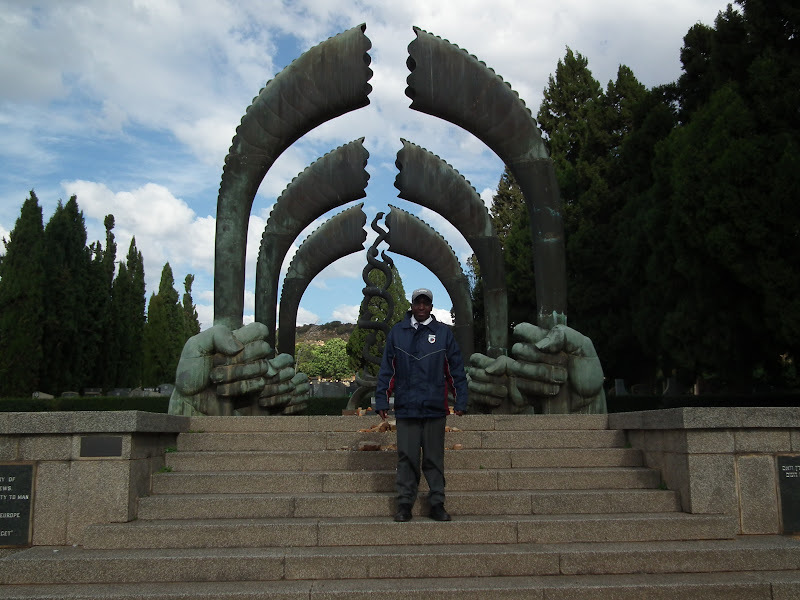 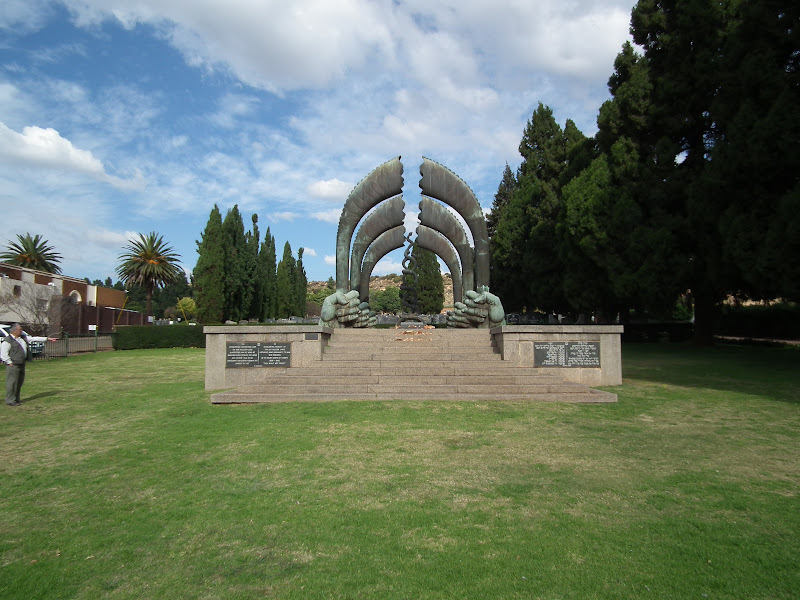 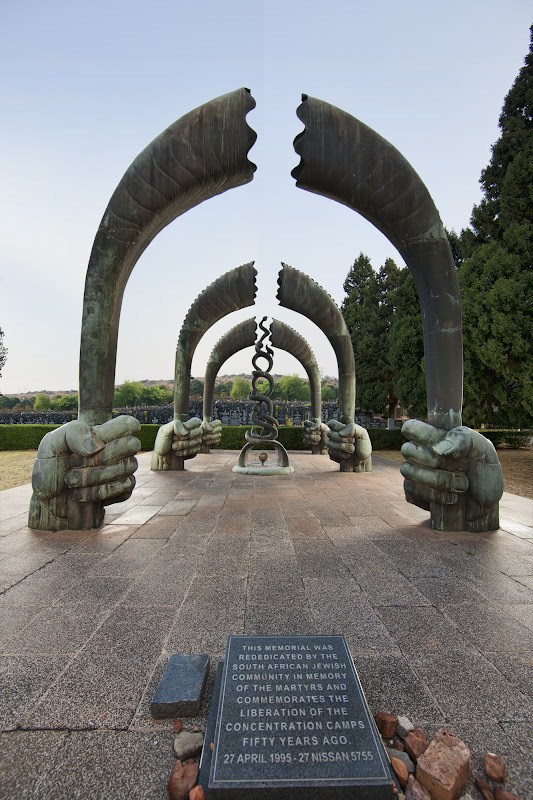 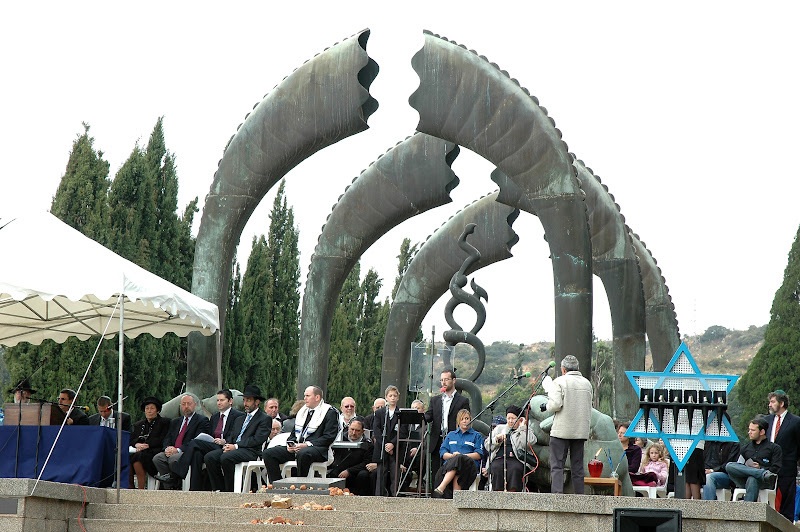 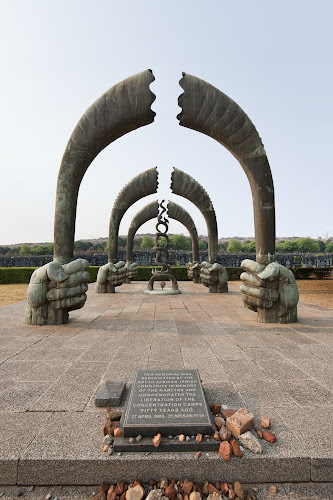 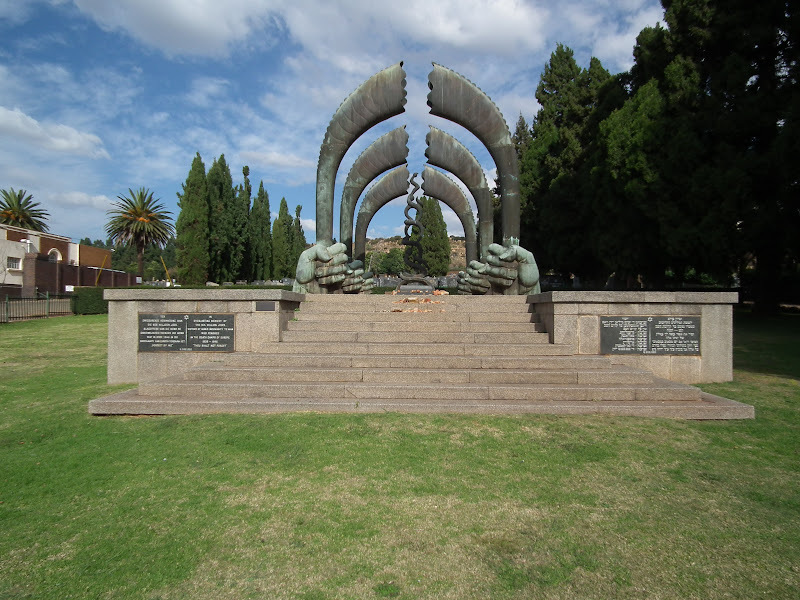 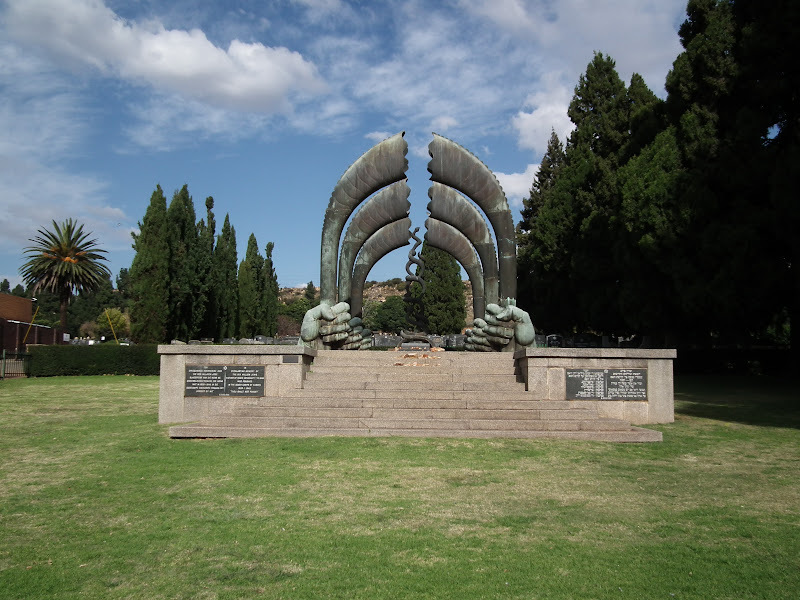 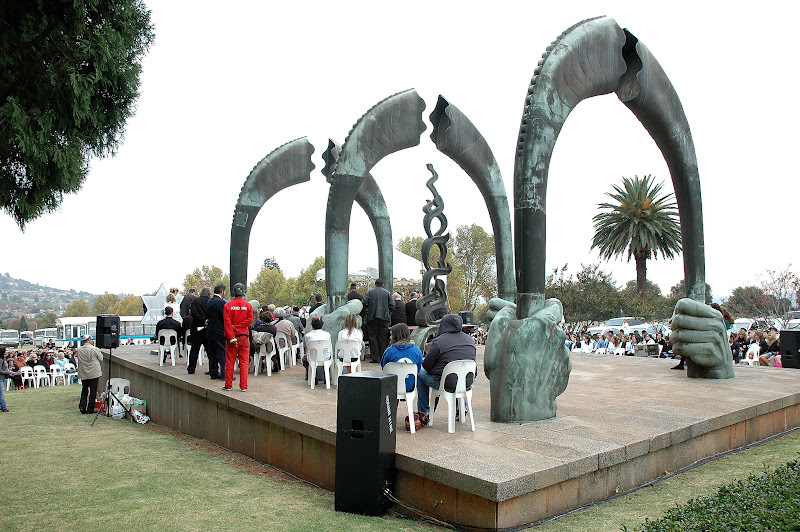 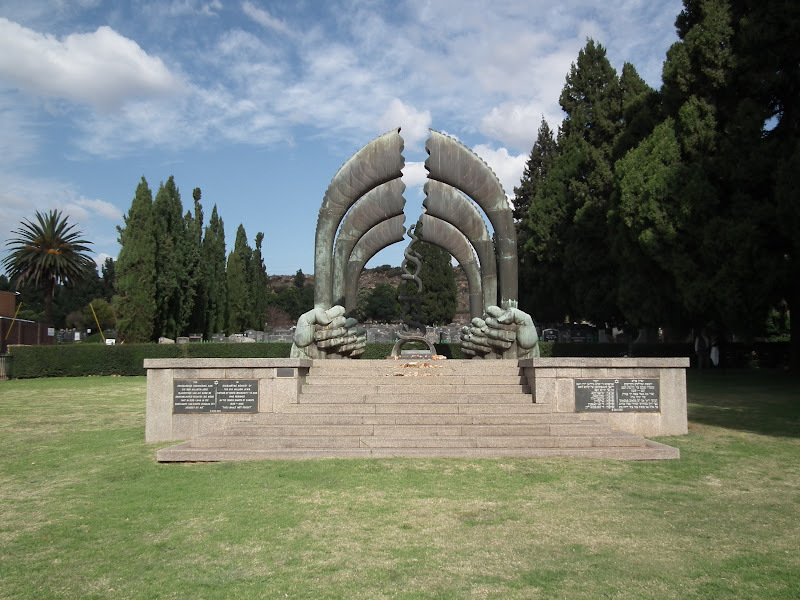 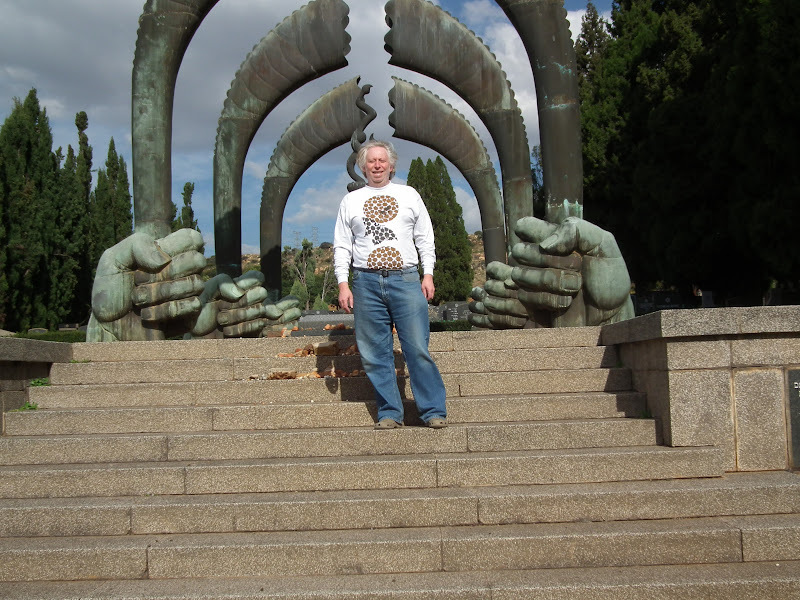 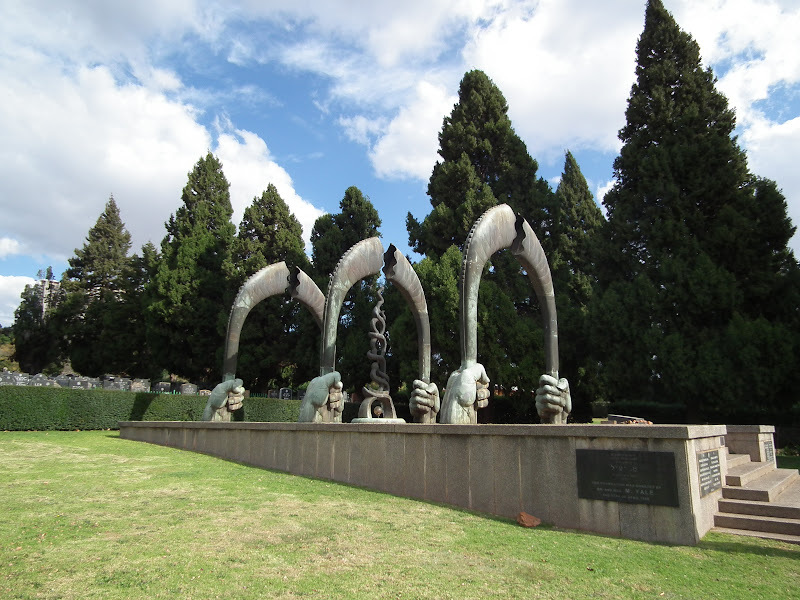 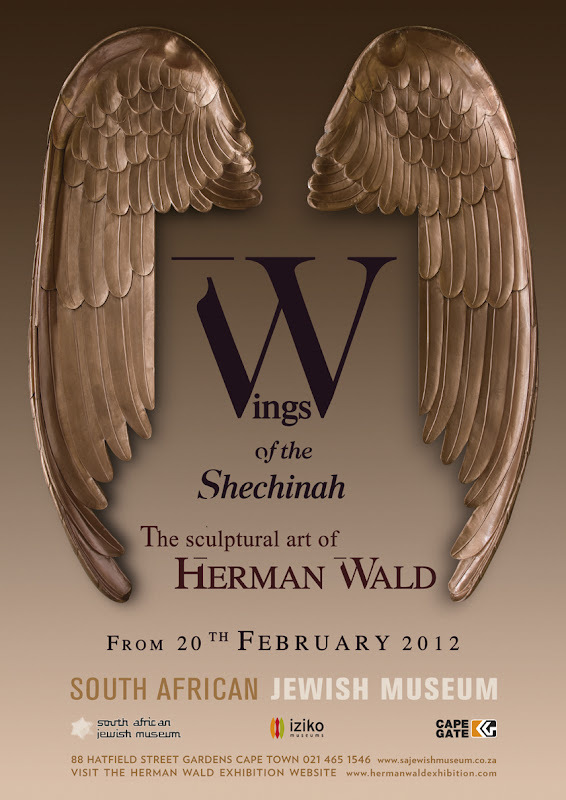 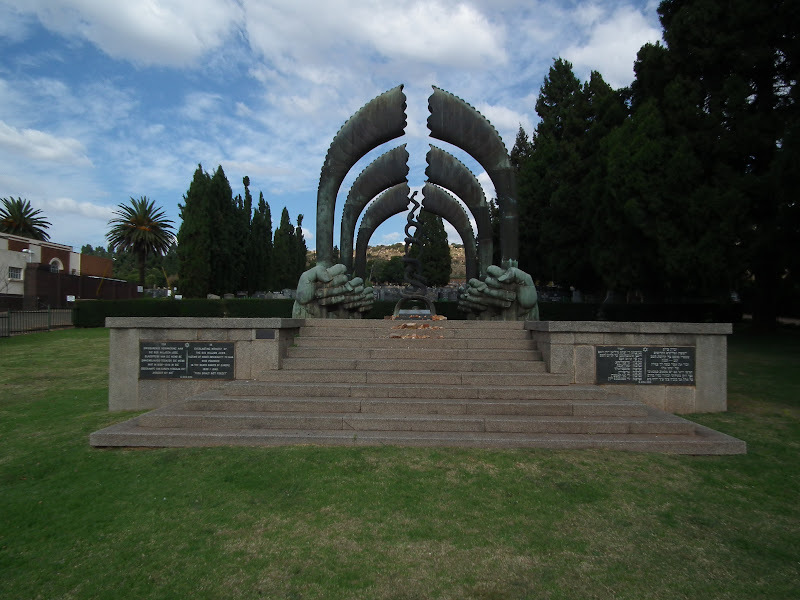 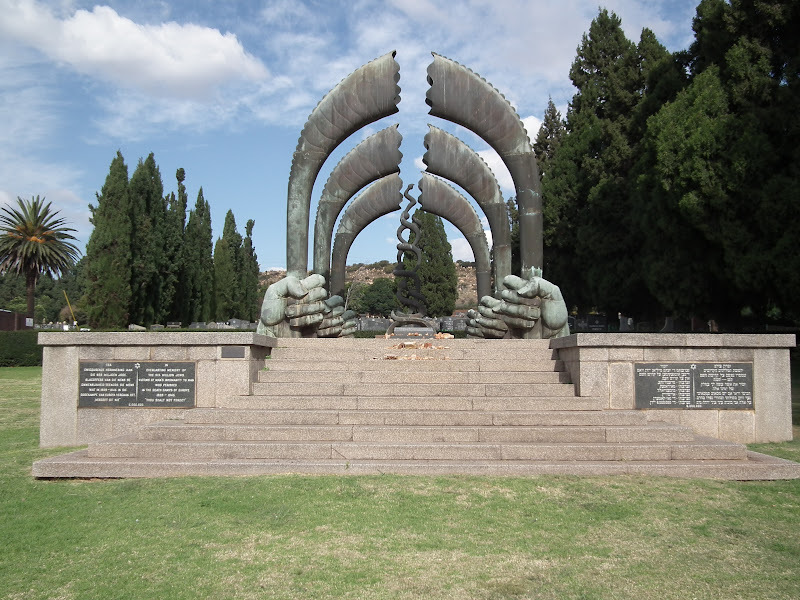 Memorial of six giant bronze shofars is dedicated in JHB. 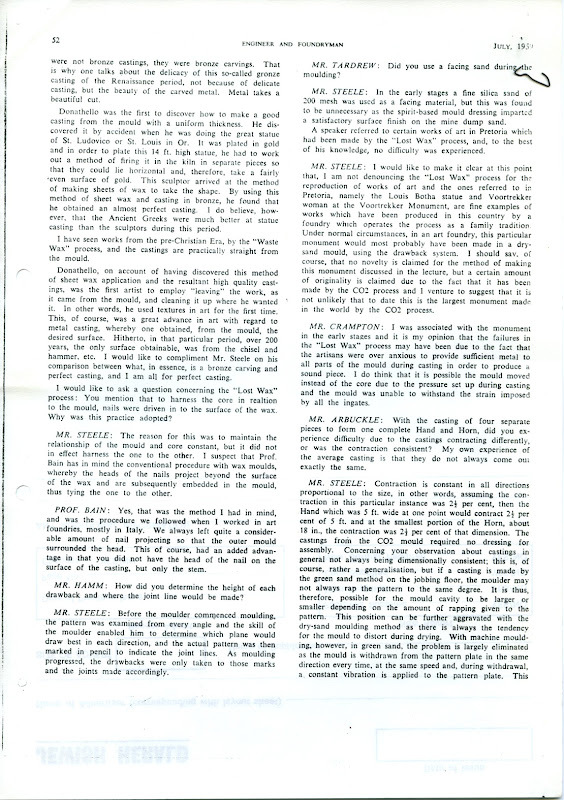 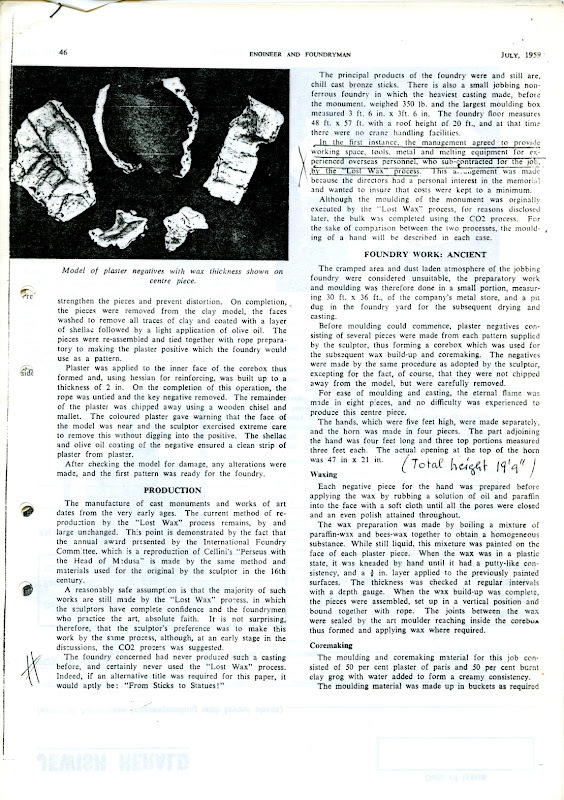 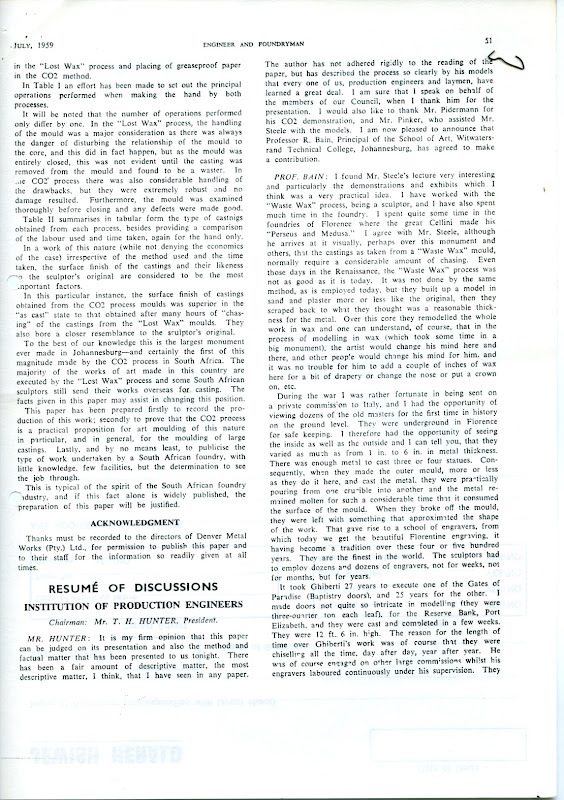 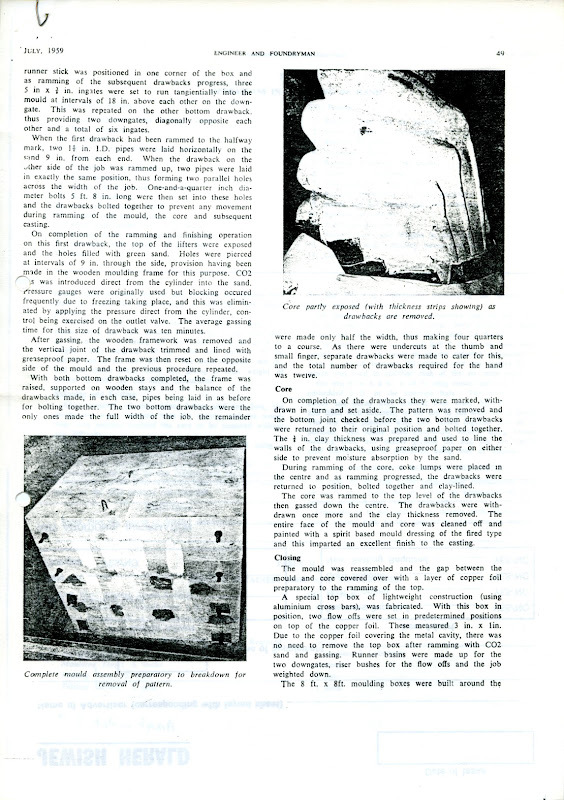 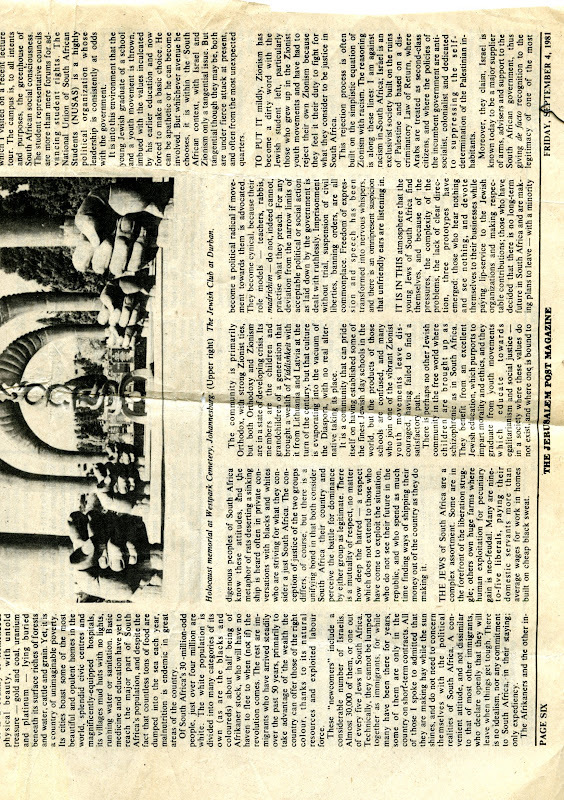 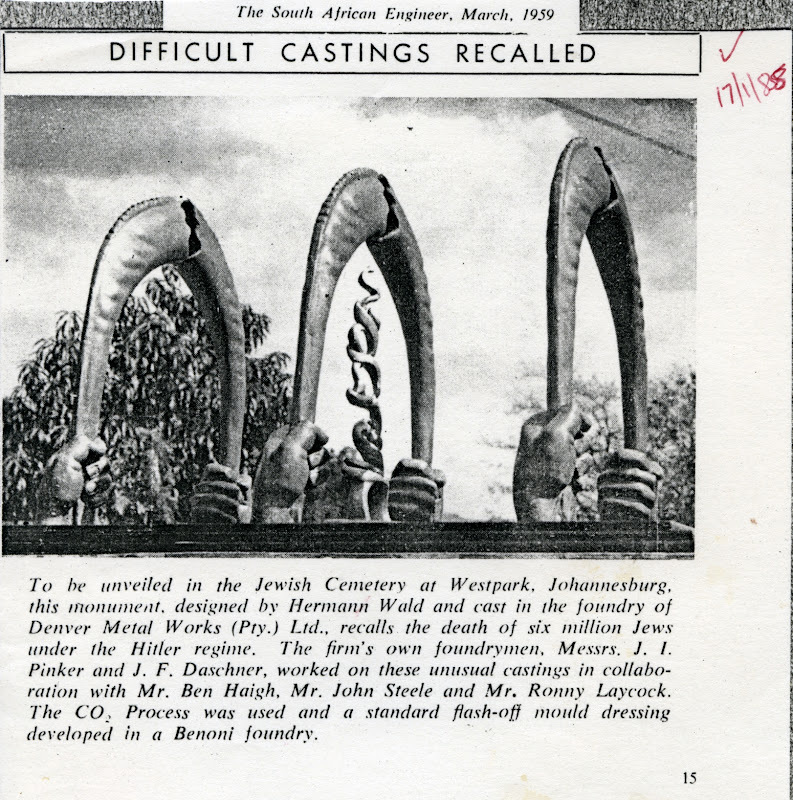 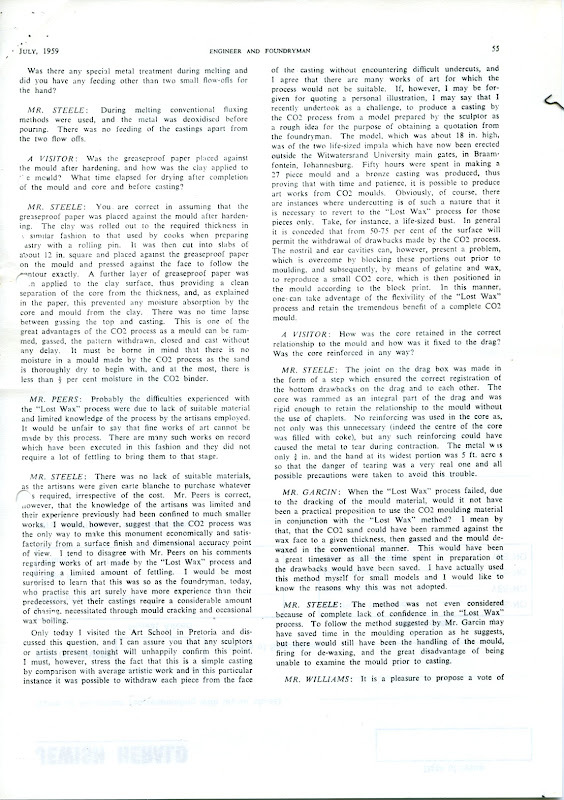 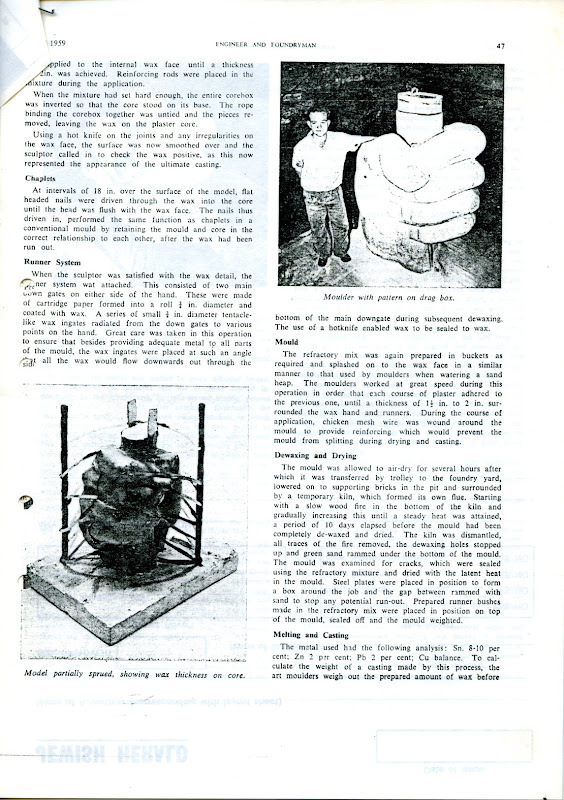 - Hatzofeay 31/5/59 Photo and commentry in Hebrew - SA Engineer March/59 Describing casting CO process. 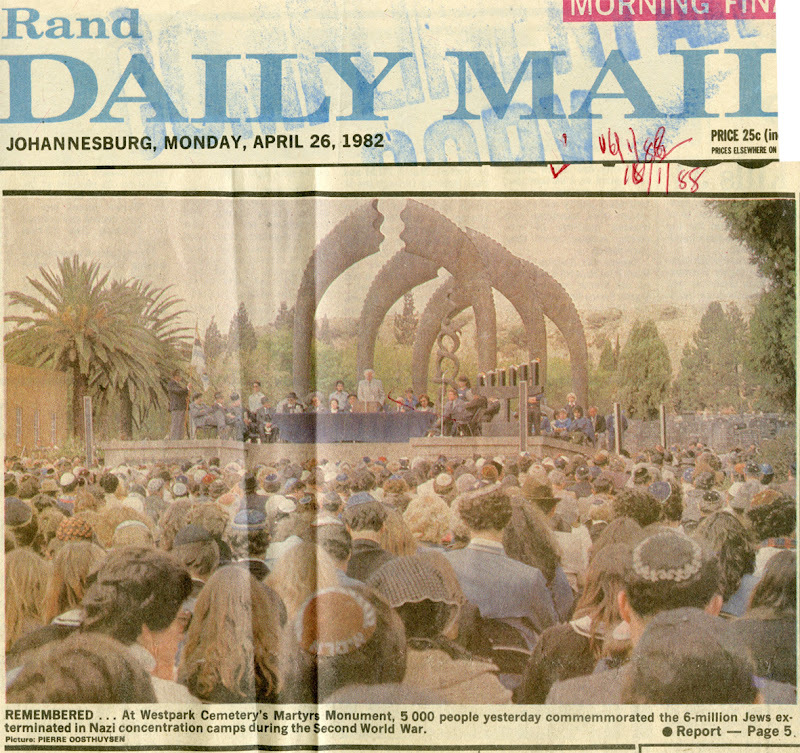 - Rand Daily Mail 26/4/82 Front page picture. 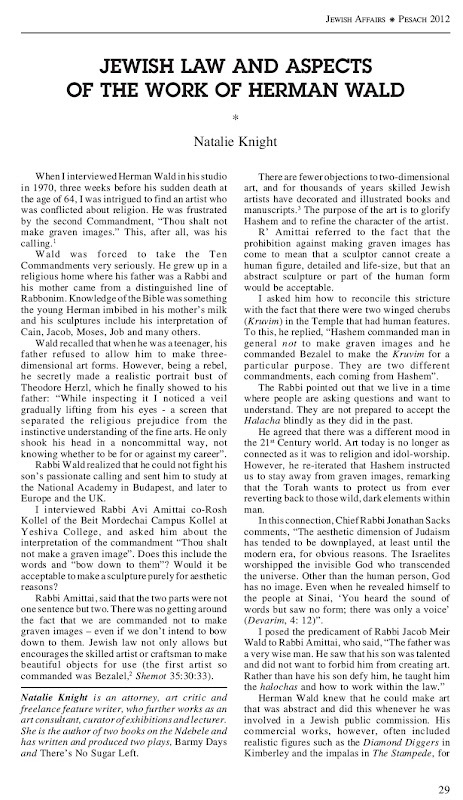 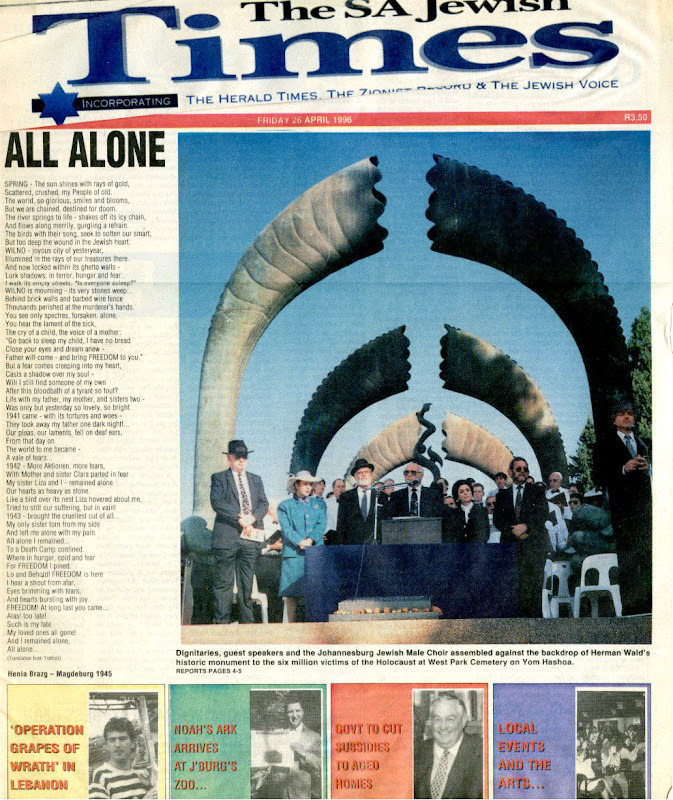 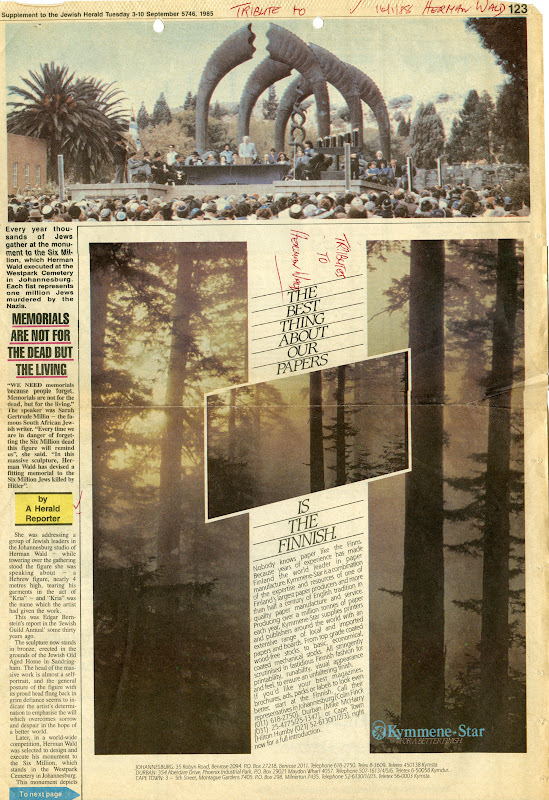 - Jewish Herald Rosh Hashanah 3-10 September 1985. 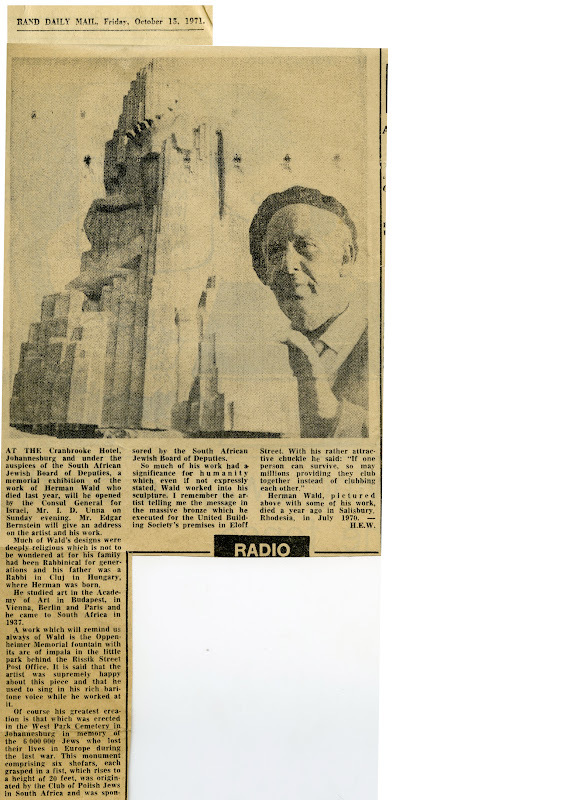 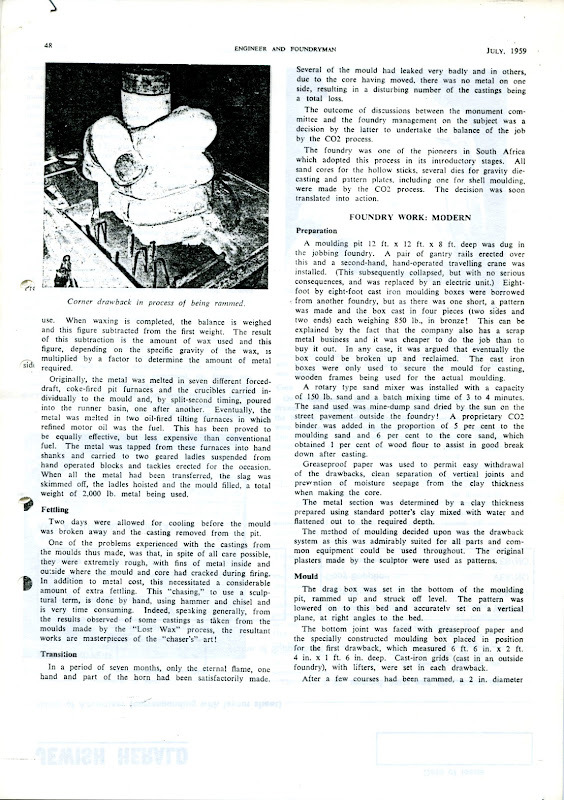 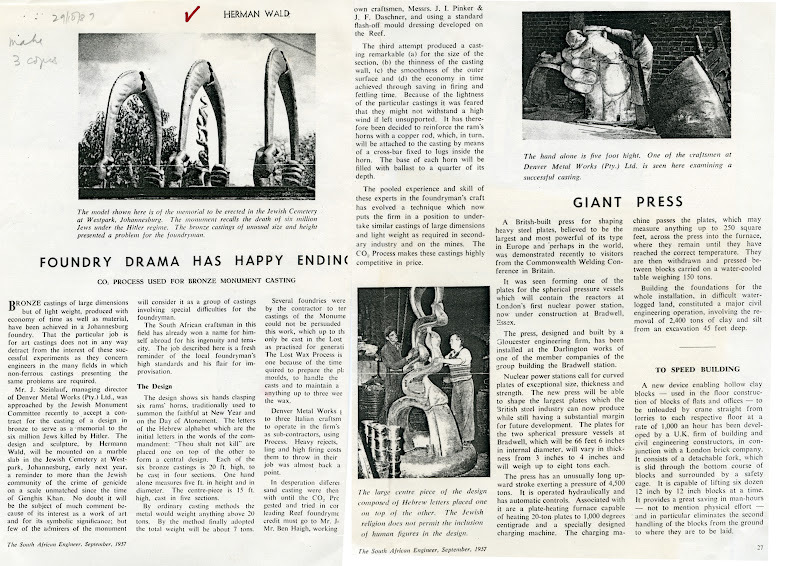 - Engineer and Foundryman July 1959 'Moulding a massive monument' 5) Chana says that HW is as follows: He was sitting in a bus with a chunk of yellow cheese in his hands. 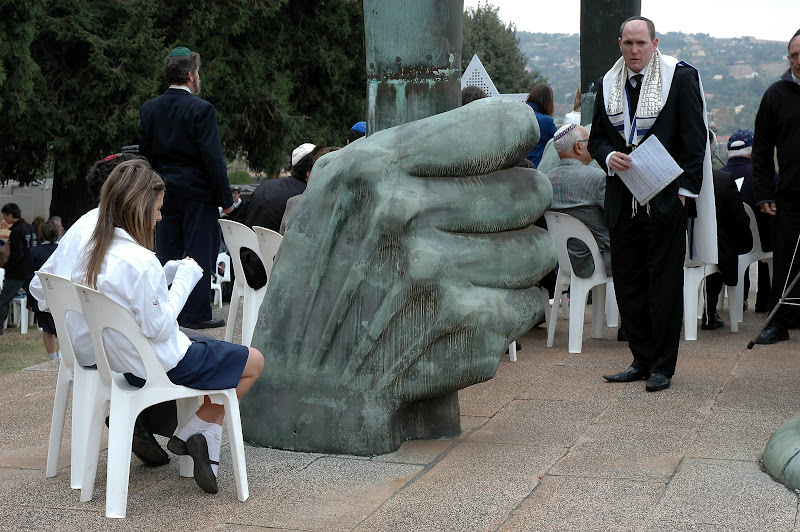 Nearby a mother was saying to her child "Blow blow" while holding a handkerchief to her nose. 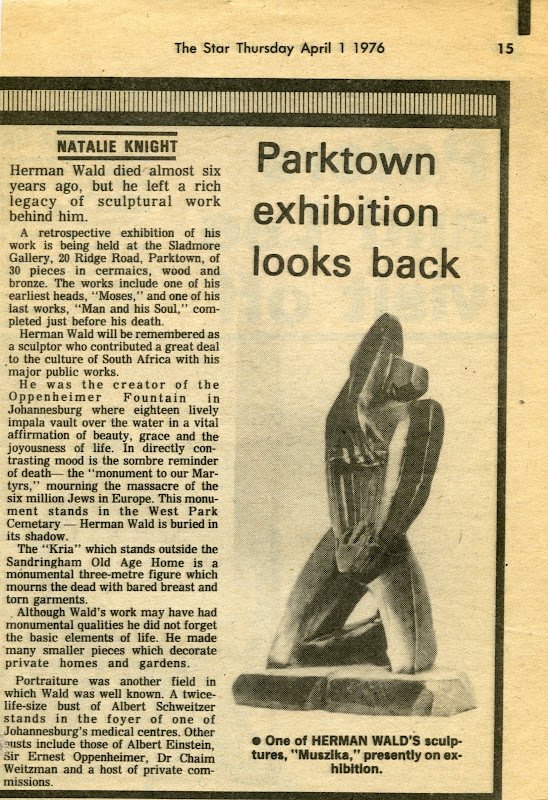 By the time he got home the maquette was fully formed in cheese.